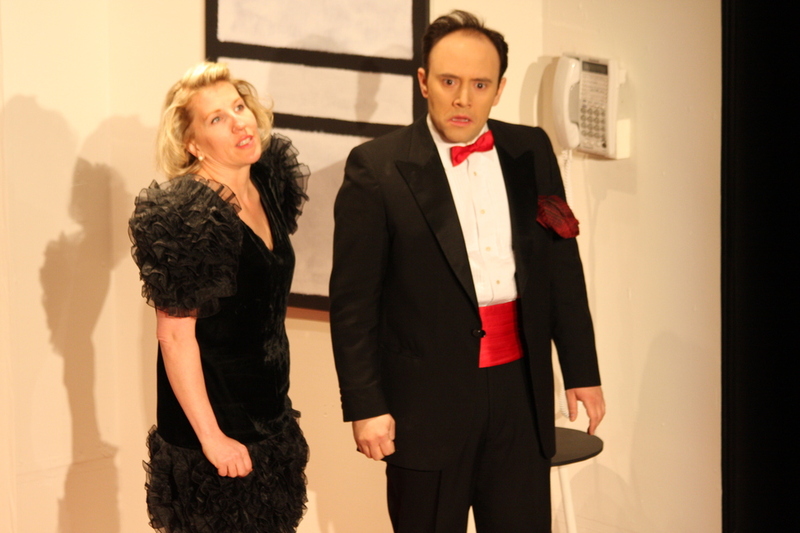 Susan Granfors in Farce of Nature. 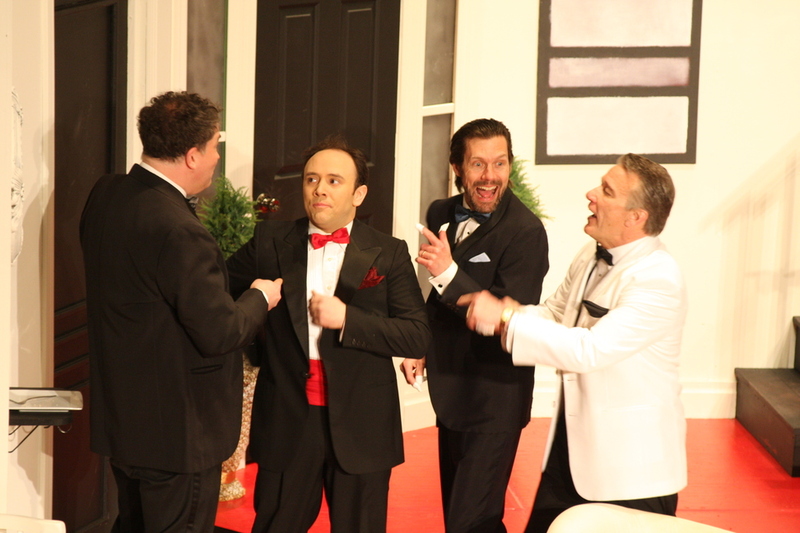 DERBY LINE — QNEK Productions is rounding out its season with the comedy “Farce of Nature,” by Jessie Jones, Nicholas Hope, and Jamie Wooten. The non-stop hilarity of this southern-fried farce highlights a day in the life of the Wilburn family of Mayhew, Arkansas. D. Gene Wilburn is taking desperate measures to save his fishing lodge the Reel ‘Em Inn, while his wife Wanelle is taking equally desperate measures to save their marriage. Add in a wacky sister, a mobster in protective custody, the guy he ratted out, a lovelorn couple, and a pack of wild animals, and you begin to see the wild and wonderful world of the Wilburns come to life. The show stars Judy Castonguay, Lisa Foster, Stephen Gonyaw, Phil Gosselin, Susan Granfors, Deborah Mackay, Brian McCrae, Andrea Webster, and John Young. Jenny Dunne directs with Elisabeth Barnes-Flint as the stage manager, along with scenic designer Bradleigh Stockwell, set engineer Rick Gosselin, and light and sound board operator Benjamin Barrup. You don’t want to miss this ridiculous southern romp and QNEK’s final Mainstage show of the 24th Season. 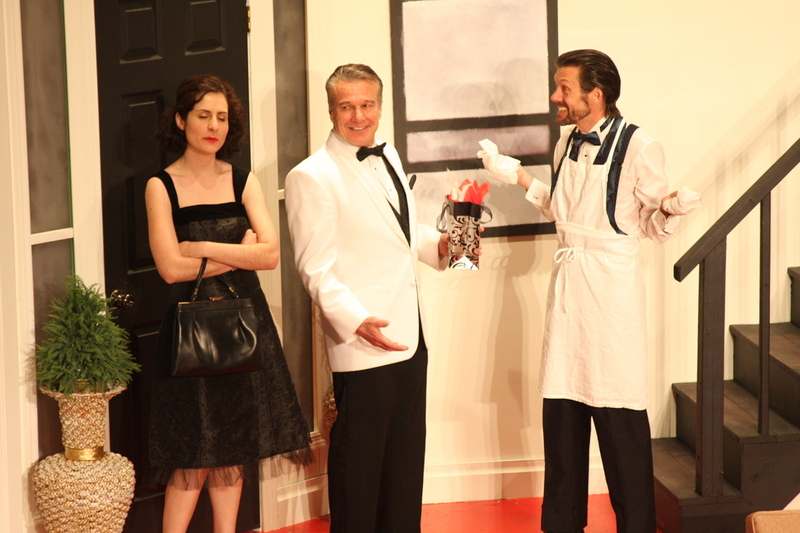 Farce of Nature plays at the Haskell Opera House September 9th – 18th, Fridays and Saturdays at 7:30 p.m., Sundays at 2 p.m.
Tickets are available by calling the QNEK Box Office at 802-334-2216, reserving online at qnek.com, by advance purchase online or by phone at catamountarts.org and the Catamount Arts Box Office at 888-757-5559, and by advanced purchase at the MAC Center for the Arts in downtown Newport. 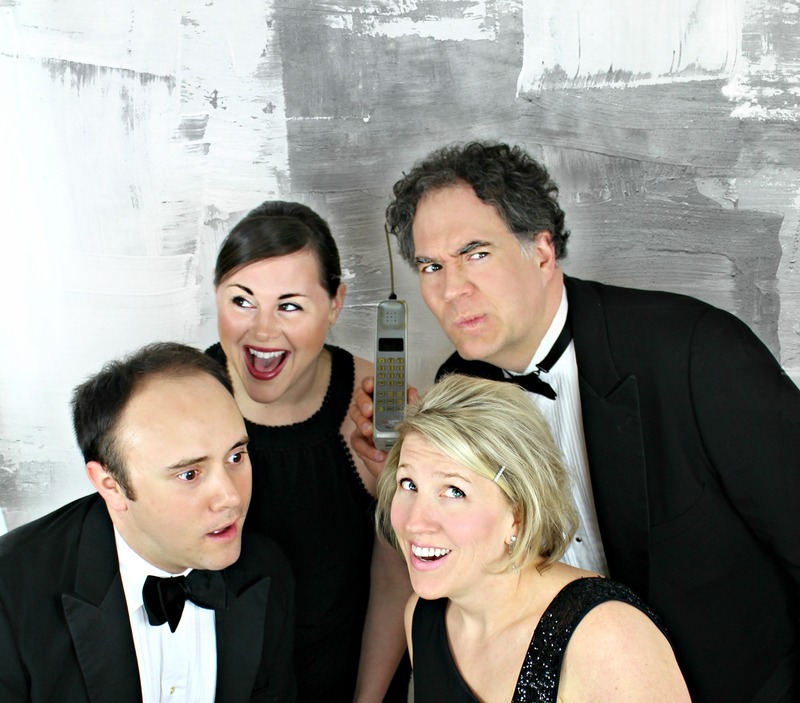 DERBY LINE — The Rescignos will return to the Haskell stage for a night of uproarious comedy, on Saturday, August 13. After a fantastic show last year, this twin act is headed back to town with new material and native musician Adam Podd on the piano. 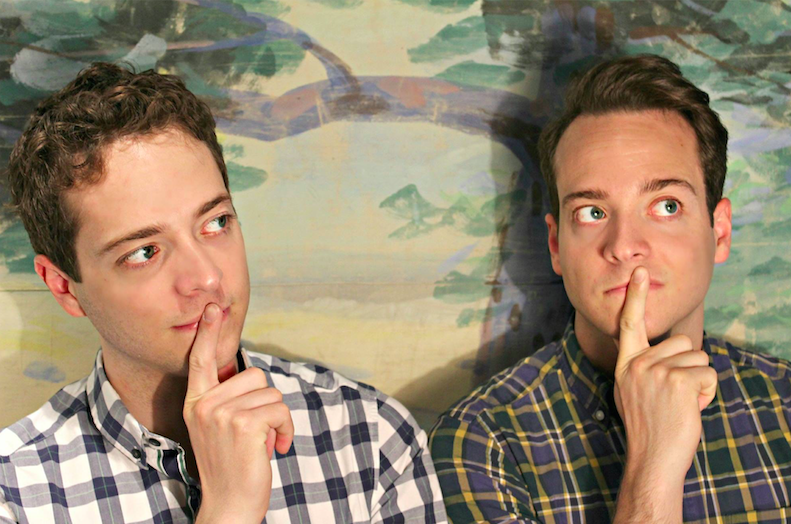 Donning sweater vests and each armed with a razor-sharp wit, Paul and Robbie Rescigno star in this comedy show that hearkens back to an old-school vaudeville act, mixing contemporary material and new music. The show features musical parody, satire, original comedic music, and the funniest banter around. 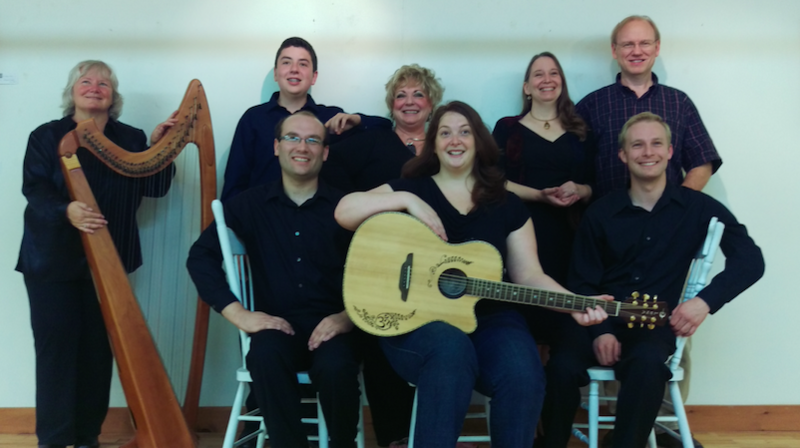 Come see The Rescignos appearing at the Haskell Opera House on August 13 at 7:30 p.m.
Tickets are available for advance purchase at QNEK.com, by calling the box office at 802.334.2216, by visiting catamountarts.org, or at the MAC Center in Downtown Newport. While all in good fun, this show should be considered PG-13 for some adult humor. 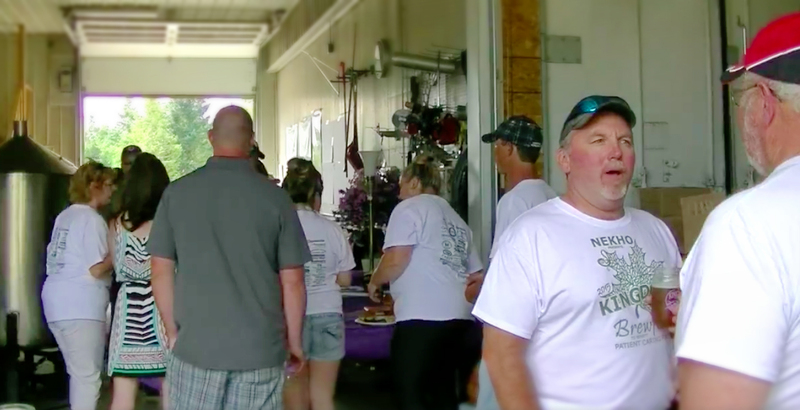 NEWPORT — The biggest beer festival around is coming to Newport this Saturday, July 23, as Dr. Les Lockridge and the Northeast Kingdom Hematology Oncology (NEKHO) gear up for the Second Annual NEKHO Kingdom Brewfest, taking place at Kingdom Brewing in Newport. The event will feature brew, food, live music and fun as NEKHO celebrate and work to replenish their Patient Caring Fund, which helps to fill in the healthcare gaps faced by their patients. Last year the event raised $14,000, and this year the goal is to add $30,000 to the fund. All money stays local to help local cancer patients with their living expenses during treatment. Proceeds go directly to patients who need it the most, whether that is a food card, a gas card, or medication and treatment co-pays. The cost is $20 for one person, $35 for two people, which includes a full BBQ dinner, live music, beer tasting and a special event glass. Festivities start at 1 p.m. and continue until 6 p.m.
Additional beer will be available for purchase from the event sponsors at Kingdom Brewing, which is located at 353 Coburn Hill Road, in Newport. All are welcome, with plenty of fun scheduled for kids as well, so come on down. DERBY LINE — QNEK Productions, the award winning international theatre company in residence at the historic Haskell Opera House, continues their 24th season with the perfect show for the entire family, SEUSSICAL. QNEK’s production of SEUSSICAL will run July 21 – 31, at 7:30 p.m. on Thursdays, Fridays, and Saturdays, and Sundays at 2 p.m.
Tony winning writers, Lynn Ahrens and Stephen Flaherty, have brought to life all of our favorite Dr. Seuss characters in a musical caper for all ages. The Cat in the Hat serves as our guide through the wonderful world of Seuss. We enter the story of Horton Hears a Who and soon find ourselves meeting any and every kind of character from the Seuss universe including Horton the Elephant, Gertrude McFuzz, lazy Mayzie, and Jojo the Who. SEUSSICAL has an incredible cast featuring actors from both sides of the border. 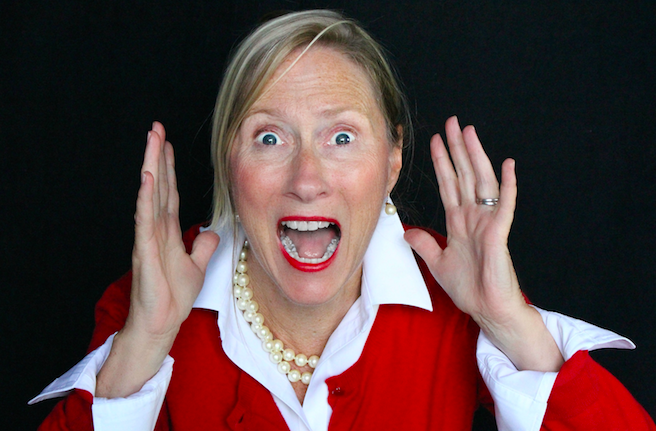 Lynn Leimer, QNEK’s Founder and Artistic Director, stars as the mischievous Cat in the Hat along with Steve Gonyaw, Charli Kellaway, Josie Pearson, Ruth Ann Fletcher, Jessi Sackett, Suzanne Norwood, Tiffany Quinn, John Young and more. 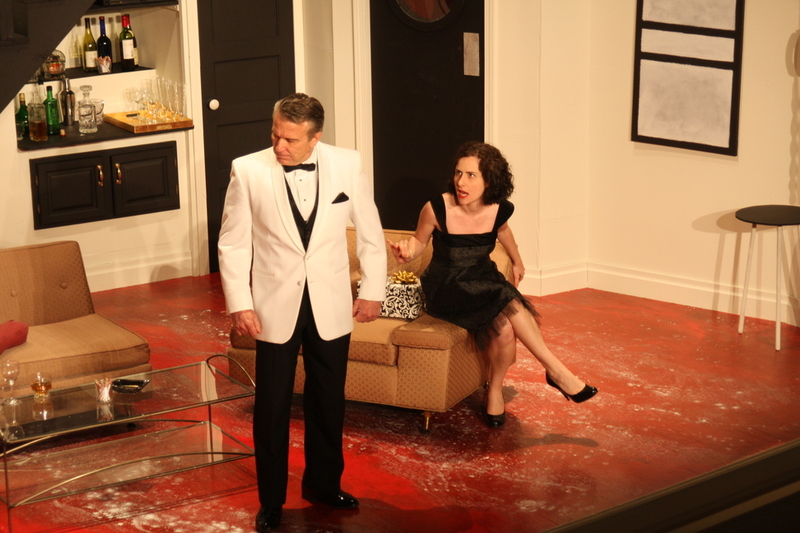 Jenny Dunne directs with choreography by Phil Gosselin and costume design by Lisa Foster. 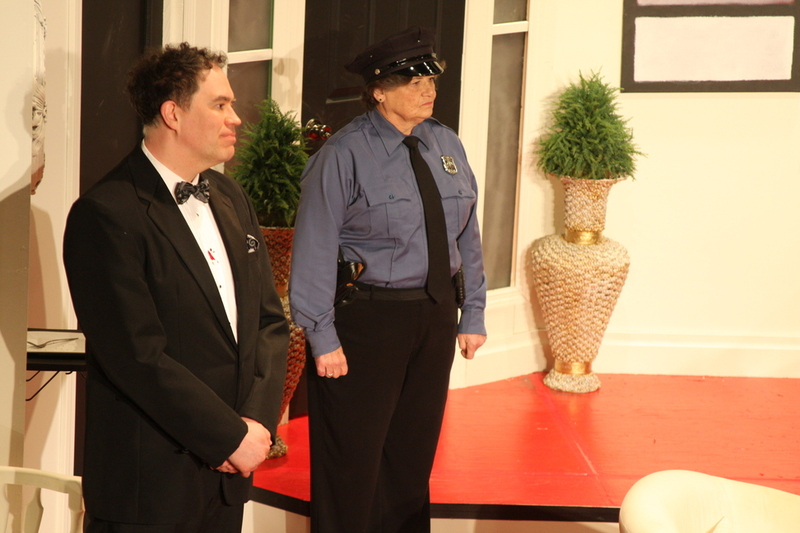 The production also has benefit performances for two local nonprofits. Come and enjoy a wonderful show while supporting local businesses. The first is for the MAC Center on Friday, July 29, and the second is for the First Universalist Parish of Derby Line on Sunday, July 31. There will also be a talkback with the cast and creative team on Sunday July 24. Any and all ticket holders are welcome to come for this questions and answer session following the show. 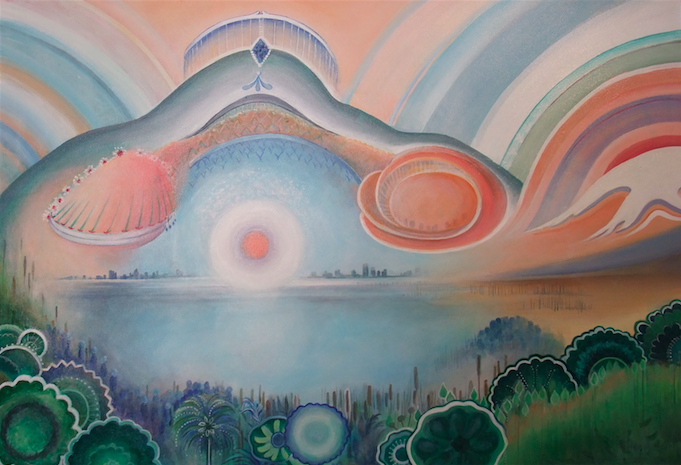 NEWPORT — The MAC Center for the Arts is proud to present Phyllis J. Hammond – A Retrospective. An opening Reception and Vernissage will be held Friday, July 1, from 5-7 p.m. at the MAC Center for the Arts, 158 Main Street, in Newport. 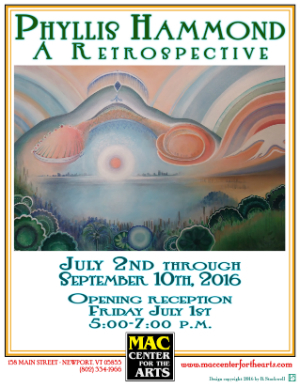 The exhibit continues through September 10, 2016. 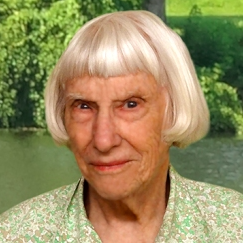 Phyllis Joy Hammond, a longtime resident of Newport Center, Vermont, died on February 3, 2016 at the age of 88. A prolific artist working primarily in watercolors and acrylics, Hammond operated from her tiny PJ Hammond Art Gallery on the Lake Road, which was the former barn of her beloved Morgan horse, Smoky. 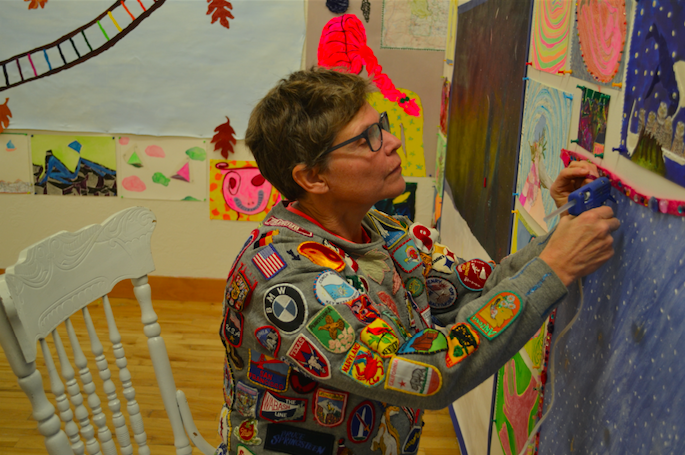 Her work was highlighted at the MAC Center for the Arts along with her three books that captured her love of wildflowers, northern landscapes and sharing art with children. Phyllis was born in July 4, 1927, the daughter of Gordon Crothers Sleeper and Martha Moler Sleeper in Long Island, New York. As a youngster she studied watercolor with Elsa Bley. She attended Wellesley College and later studied with Hyman Bloom and took courses at the New York Botanical Gardens, presaging her life-long love of flowers. 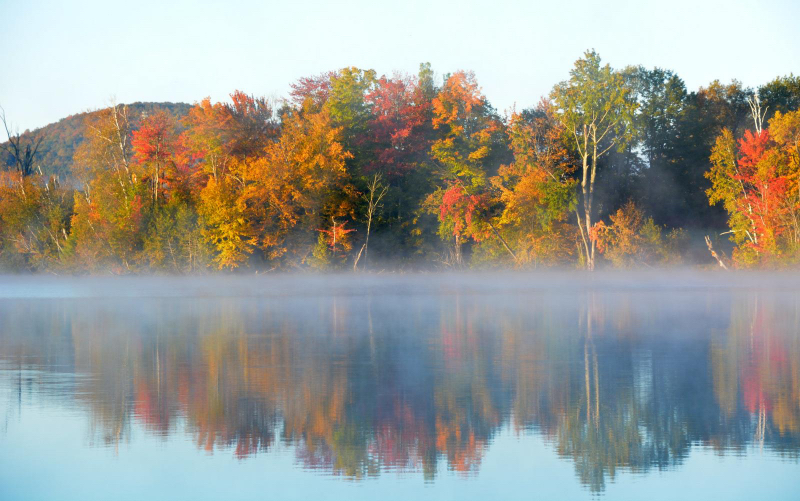 Hammond began traveling to Lake Memphremagog as a child, where her parents owned summer homes and in 1957 she married Milton Dale Hammond. Phyllis and Milton were married for 54 years until Milton’s death in 2012. Hammond had a long love affair with northern landscapes, she lived several miles from the Canadian border. 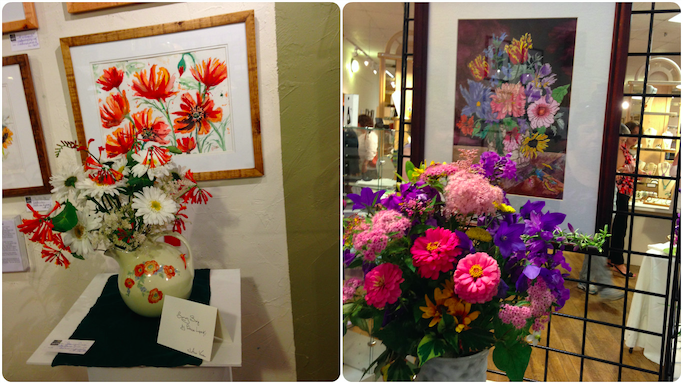 Underlying themes of her work were wildflowers, forest foliage, mountains and seeing more spiritually. In 1998, at the age of 71, her life took a decidedly entrepreneurial turn with the writing and publication of “Traveling with Wildflowers: from Newfoundland to Alaska.” As a result of the book’s publication, Hammond was invited to speak in Denali National Park, Alaska, St John’s Botanical Garden in Newfoundland and at many flower shows. 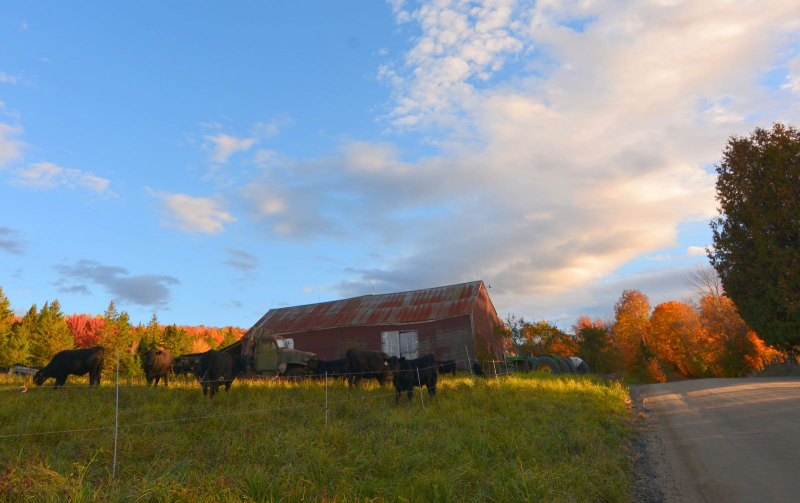 An article featuring her and her book appeared in Vermont Magazine. Along with book sales, she sold thousands of lithographs, prints, postcards, and bookmarks base on the artwork in Traveling with Wildflowers. The family of Phyllis Hammond have provided a philanthropic caveat for the exhibit, that all books and prints sold will be a 100% benefit to the MAC Scholarship fund. 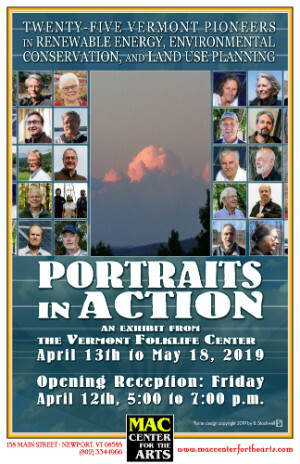 For more information about this exhibit, please visit www.maccenterforthearts.com or call 802-334-1966. 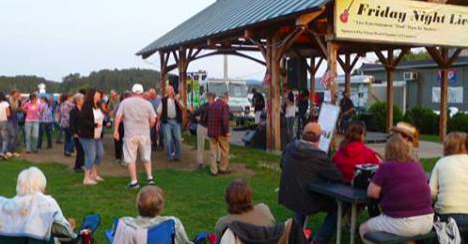 ISLAND POND — The Island Pond Friday Night Live music series is back again this summer, featuring a variety of local and regional bands every Friday night all summer long. The concert series starts this Friday, June 17, featuring Evansville Transit Authority performing from 6 p.m. – 10 p.m. There will be food and craft vendors on hand with something for everyone. The season continues on June 24, featuring Mark Shelton, July 1, with The Atlantic Effect and a bonus edition on July 2, with Dark Horse followed by the spectacular Fireworks Extravaganza on the lake. The season resumes on Friday July 8, featuring the music of the Beatles with Studio Two, July 15, with local favorite Rock On, July 22, with The Hitmen, and July ends with Classic Rewind on July 29. August heats up with The Party Crashers on August 5, Without Ray on August 12, and The Adams Band on August 19. The season ends like it started with a party on the lake featuring Evansville Transit Authority. The entire Island Pond Summer Events schedule can be found at www.VisitIslandPond.com, including a full listing of all Fourth of July weekend activities. NEWPORT — The 3rd Annual Summer Block Party in the Kingdom, a free community-wide event, will be held June 16 from 3 p.m. to 6 p.m. at Gardner Park in Newport. 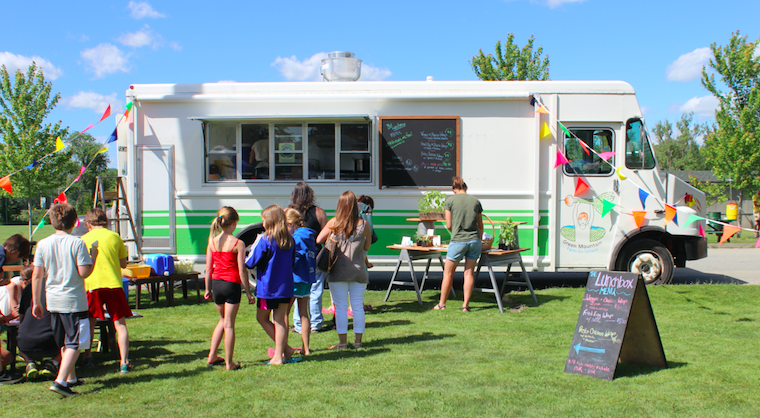 Kids 18-years-old and younger will be treated to a free meal from the Lunchbox food truck as Green Mountain Farm-to-School officially kicks off its summer meal program, which will be serving free meals to kids in the NEK the rest of the summer. There will also be over 15 community partners with booths, live music, and a family fun-run that begins at Gardner Park. 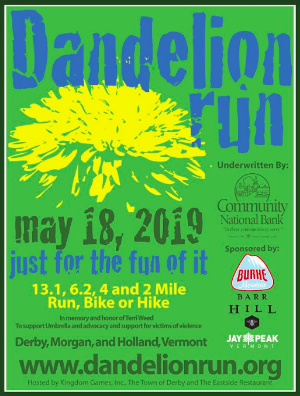 The family-fun run, which will be a free, one-mile run or walk for all members of the family beginning and ending in Gardner Park at 3 p.m., will be hosted by Kingdom Games, a local group that organizes and promotes outdoor activities in the Northeast Kingdom. All ages are encouraged to bring their sneakers and run or walk. Games and activities for families will include a petting zoo, free ice cream from Kingdom Creamery, a climbing wall from the Vermont National Guard, and a selection of food for adults that are available for purchase from the Lunchbox food truck. “We hope to see the whole community come out and enjoy a fun afternoon,” said Katherine Sims, executive director, GMFTS. The event is free and open to the public thanks to local businesses like Community National Bank. 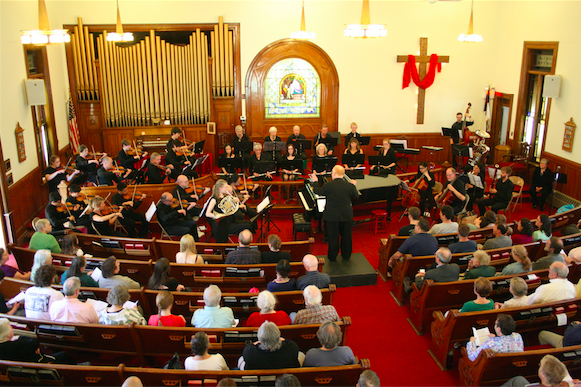 NEWPORT — The Newport Area Community Orchestra is presenting its 5th Annual Spring Concert on Sunday, June 5th at 3:00 p.m. at the United Church in Newport. This year, the orchestra will be featuring its largest ensemble to date, now totaling 45 members. The orchestra has established itself as an international ensemble, with members from the Northeast Kingdom, Maine, Japan, Taiwan, China, Canada, New Hampshire and Massachusetts. They will be featuring Bob Smith, trumpet, Howie Arzt, clarinet, and Peter Storrings, tenor saxophone, as soloists for the concert. Also featured will be Molly Kelly as the orchestra’s first assistant conductor who will be conducting “The Prayer of St. Gregory,” for solo trumpet and strings by Alan Hovhaness. The program will include music by Hovhaness, Prokofiev, Verdi, Von Weber and Bizet. This concert promises to be one of the orchestras best, so mark the date on your calendars. Admission will be a donation of $5 at the door. NEWPORT — The MAC Center for the Arts is presenting a presentation of authors and musicians called “LUNARt MADNESS,” crafting words and song in celebration of the full moon and spring. 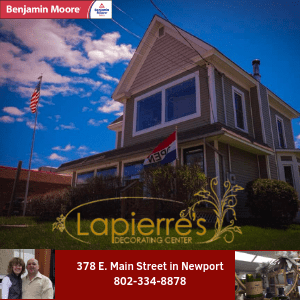 The event will take place Saturday, May 21, from 7 to 9 p.m. at the MAC Center for the Arts, located at 158 Main Street, in Newport. The event is open to the public, and all are invited to attend. The exclusive lineup of MAC writers includes Jerry Johnson, Lisa Foster, Mary Brenner, Dianne LaPlante and Mary Liz Riddle. MAC musicians include Nate Sargent, Janice and Ben Luce, Brian McCrae, John Selmer with Emcees Susan-Lynn Johns and Lynn Leimer. Original prose, original songs, classic music and audience participation sing-alongs will embellish the enchantment of seasonal equinox. Seating will be limited, but if you buy your tickets in advance, you can enjoy a 10 percent discount at either Newport Ciderhouse or Dusit Thai. 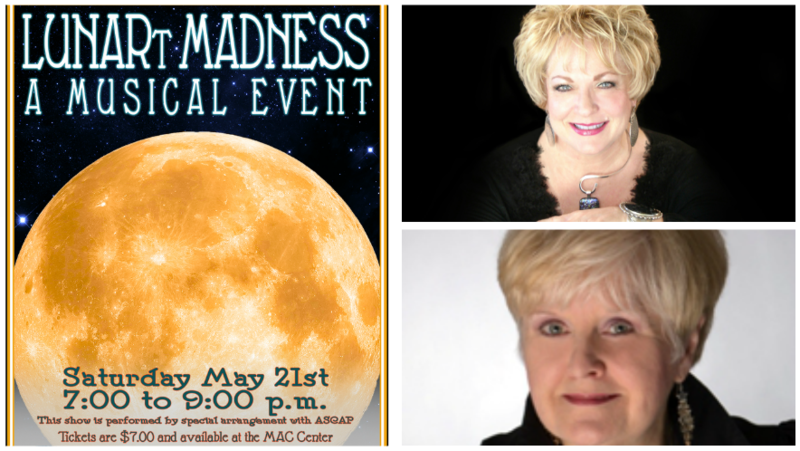 LUNARt Madness is a benefit for the MAC Center and general admission is $7.00. NEWPORT — MAC Center for the Arts hails a new photography exhibit opening Friday, May 6, running through Saturday, June 11, 2016. The exhibit, “Far and Wide, Near and Dear,” by photographer and MAC member, Cindy Smith, display her myriad of luscious images gleaned from her vast travels. Her choice of medium during her teaching days had been sculptural, using wood, clay, and glass. 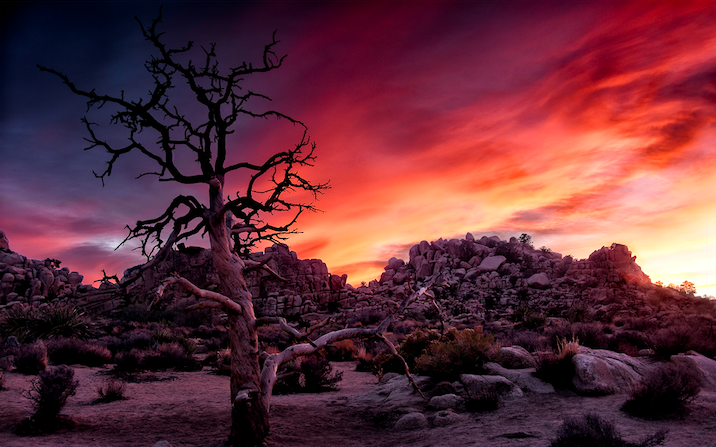 Retirement opened a new realm for her as an artist, which quickly became photography. There will be an Opening Reception, Friday, May 6, from 5-7 p.m. The exhibit can be seen during regular business hours: Tues-Sat 10-5 until June 6, when summer hours begin, which means the MAC will be open on Mondays as well. 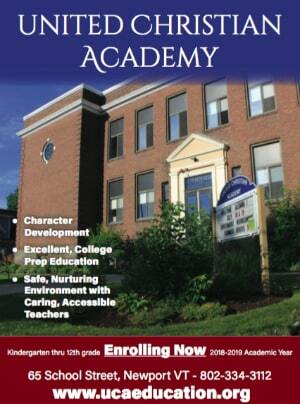 For more information, please visit www.maccenterforthearts.com or call 802-334-1966. All photos by Tanya Mueller. The show features a stellar cast from both sides of the border. 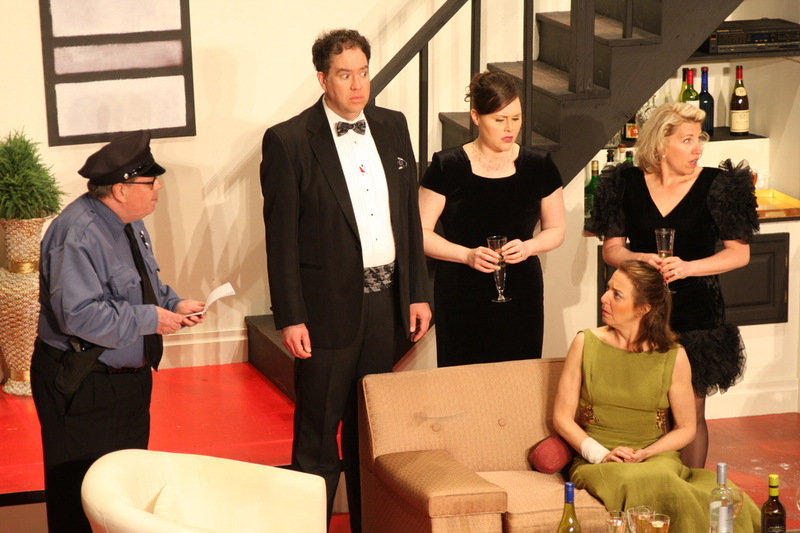 Mike Desjardins, Alan Franklin, Kim Gannon, Phil Gosselin, Mary Hoadley, Sue Kuzma, Audrey Langlois, Rhonda Lucas, Ross Murray, and Chris Planetta make up the ensemble cast that kept audiences laughing at every turn. The show is Directed by Jenny Dunne. If you missed opening weekend, be sure to catch one of the upcoming shows taking place this Friday, Saturday, and Sunday. Friday and Saturday shows start at 7:30 p.m. Sunday will be the final performance at 2 p.m. Please note that this play contains adult language. Top Row L - R: Mary Hoadley, Chris Planetta, Phil Gosselin Middle Row L - R: Rhonda Lucas, Mike Desjardins, Audrey Hamilton Bottom Row L - R: Alan Franklin, Sue Kuzma, Kim Gannon, Ross Murray. 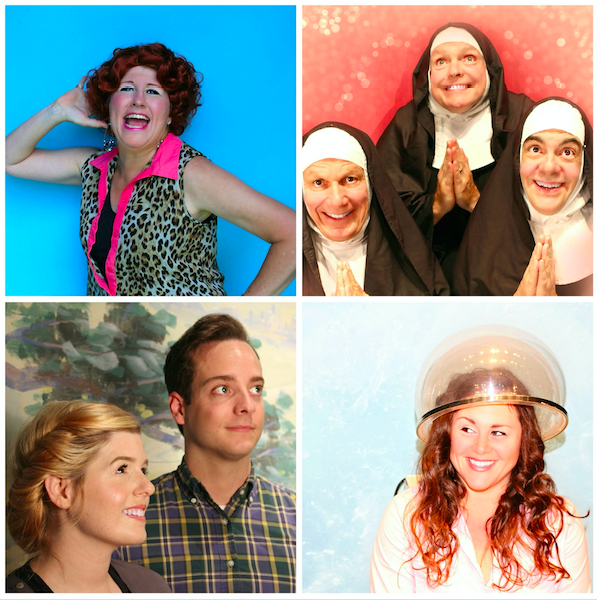 Clockwise from top L: ​Mary Hoadley, Chris Planetta, Rhonda Lucas, Phil Gosselin. 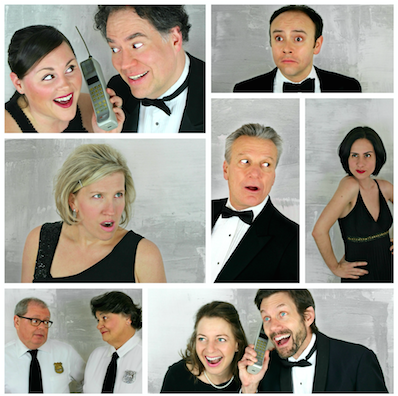 DERBY LINE — QNEK Productions, the award winning international theatre company in residence at the historic Haskell Opera House, is opening its 24th season with the uproarious Neil Simon farce, Rumors, opening April 22. The show will feature a stellar cast from both sides of the border. Mike Desjardins, Alan Franklin, Kim Gannon, Phil Gosselin, Mary Hoadley, Sue Kuzma, Audrey Langlois, Rhonda Lucas, Ross Murray, and Chris Planetta make up the ensemble cast that will keep you laughing at every turn. Deputy Mayor of New York City, Charley Brock, and his wife, Myra, are throwing a fabulous fête to celebrate their ten year anniversary, with their best friends in attendance. The problem? Charley’s had a mysterious accident and Myra is missing in action. His lawyer, Ken and wife Chris have to get their story straight before the others arrive and start asking questions. 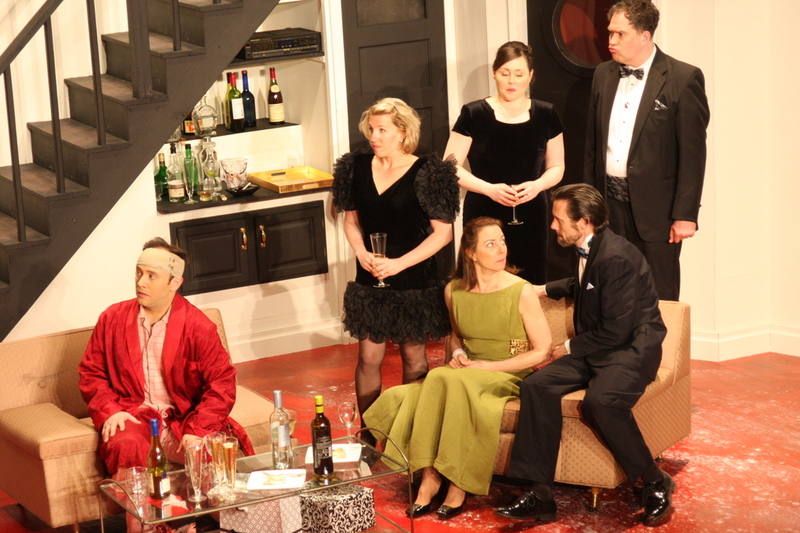 But, it seems time has run out just as the play begins and the evening quickly spins off into farcical hilarity. The production is underwritten by North Country Hospital and Lynda Graham Barber, in Memory of Ray C. Barber. 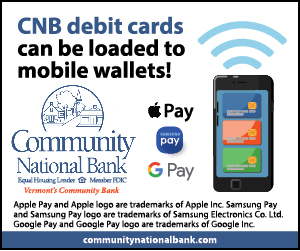 Additional support comes from Community National Bank and Community Circle. 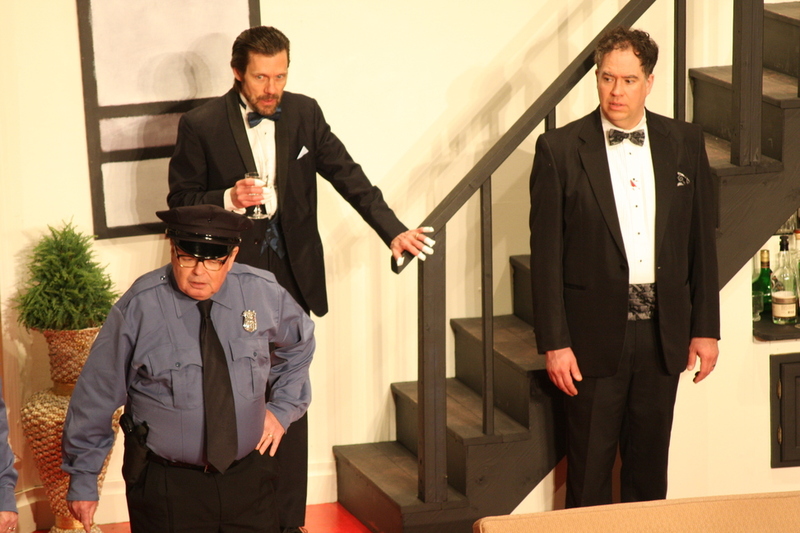 Don’t miss this hilarious start to QNEK Productions 24th season at the historic Haskell Opera House. 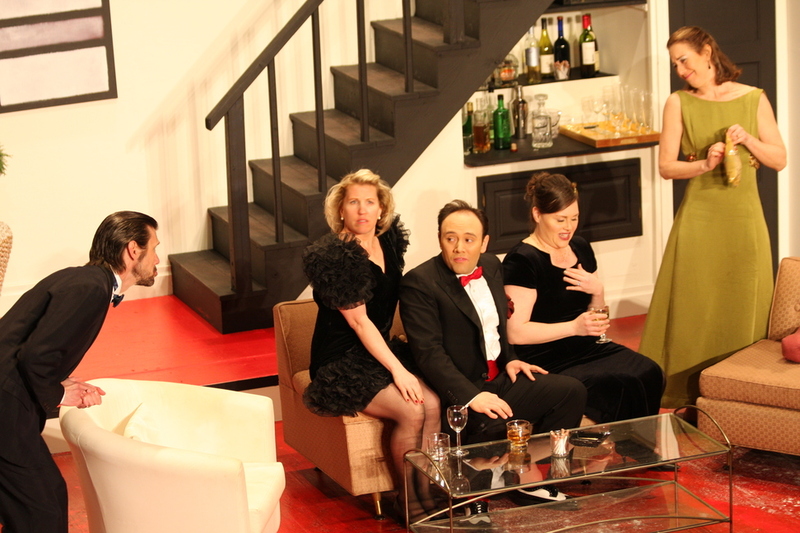 Rumors by Neil Simon runs April 22 – May 1. Fridays and Saturdays at 7:30, Sundays at 2 p.m.
Andy Titus age 5. All photos by Diana Poulin. Brianna and Kailee Herman with mom, Melissa Herman. 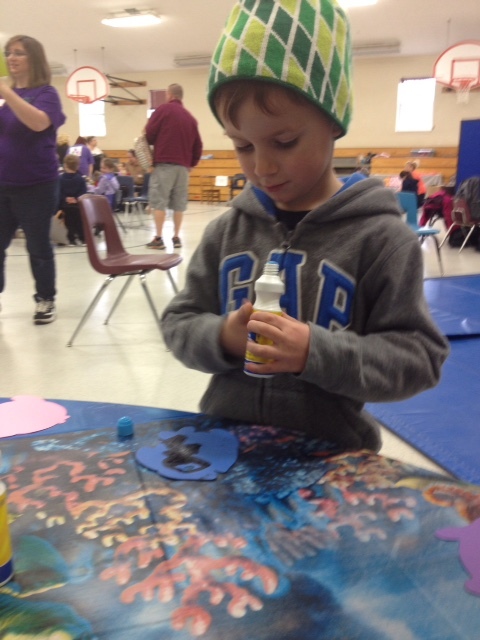 COVENTRY — The Memphremagog Arts Collaborative recently participated in the creative adventures at Coventry Elementary School called “Dabble Day,” sponsored by Building Bright Futures with the support of area businesses and organizations. 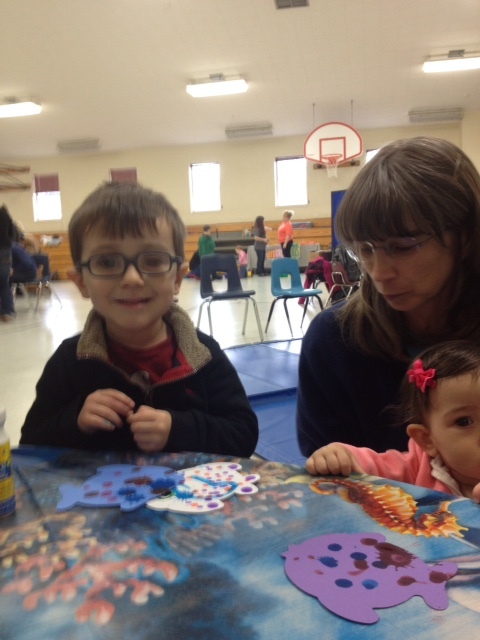 Children up to the second grade and their favorite adult companions were invited to enjoy a day filled with activites. 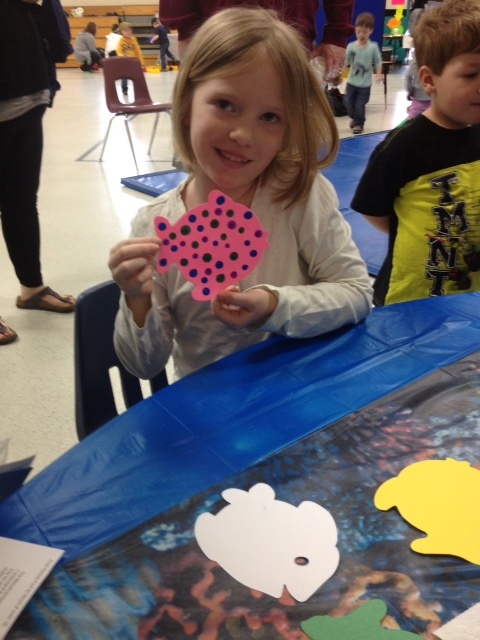 Many youngsters “dabbled” with Diana Poulin and Patty Oliver-Smith from the MAC to make unique, colorful and imaginative fish puppets. These puppets were made to tie in with the presentation of “Swimmy,” based on the book by Leo Lionni, a story about a little fish who shows his friends, with ingenuity and teamwork, how to overcome danger. NEKPA and Community National Bank presented a puppet show by PuppeTree, an Artist-in-Residency program through the Vermont Arts Council. PuppeTree is a nontraditional puppet theater company that was created by Ann Legunn in which various community venues, from school to senior centers, become active participants in all aspects of theatre arts. PuppeTree is unique in that the participants not only build the puppets, but are encouraged to handle those made by Ann Legunn, the way you would handle props, costumes and scenery. 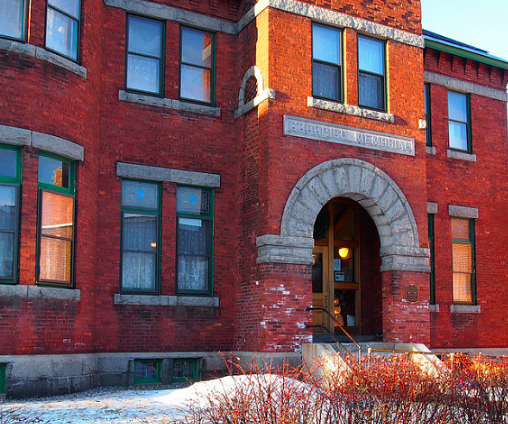 For more information about MAC Center for the Arts, a local non-profit, visit www.maccenterforthearts.com or call 802-334-1966. Photo: 2015 Season Highlights. Top, L-R: Ruth Ann Fletcher, Mike Desjardins, Brian McCrae, Tim Daley. 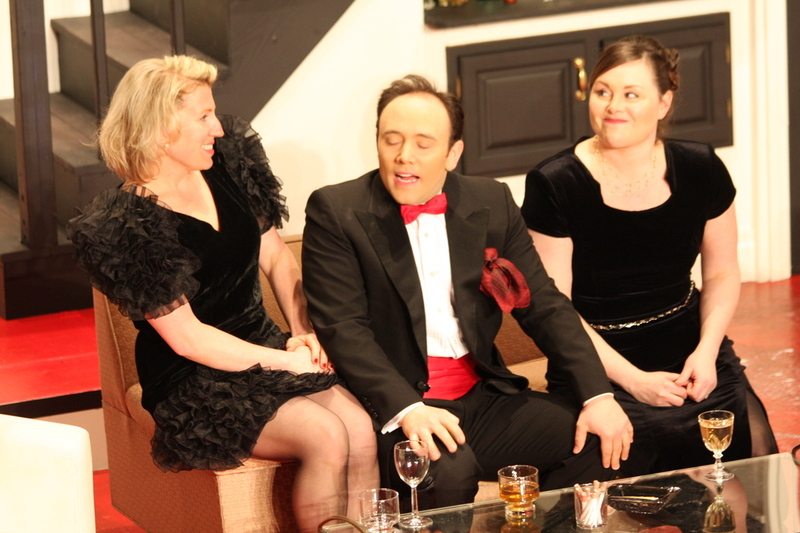 Bottom, L-R: Jenny Dunne, Robbie Rescigno, Mary Hoadley. DERBY LINE — QNEK Productions, the award winning International theatre company in residence at the historic Haskell Opera House, is proud to present their 24th season lineup. 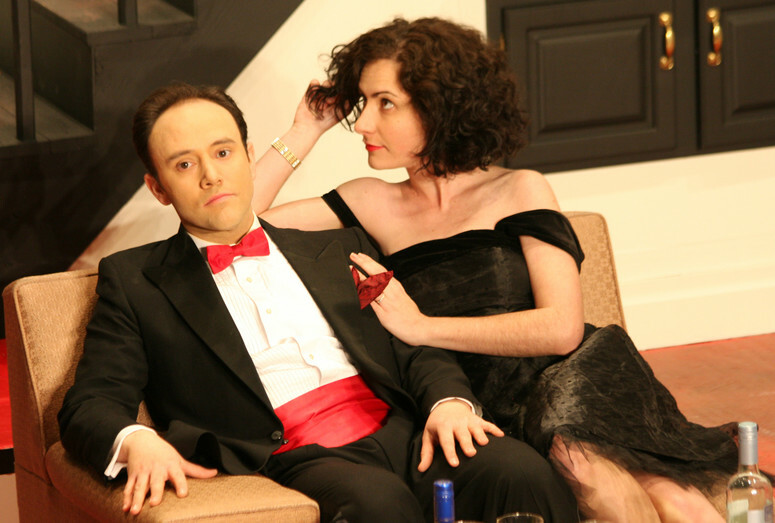 QNEK will kick off its season with the raucous Neil Simon comedy Rumors, directed by Jenny Dunne and featuring QNEK Producer Phil Gosselin. Four couples find themselves in a bind when they show up for a dinner party where the hosts are indisposed to say the least. Up next is a journey into your imagination with Seussical by Stephen Flaherty and Lynn Ahrens, based on the works of Dr. Seuss. Adults and children alike will love this musical for all ages. 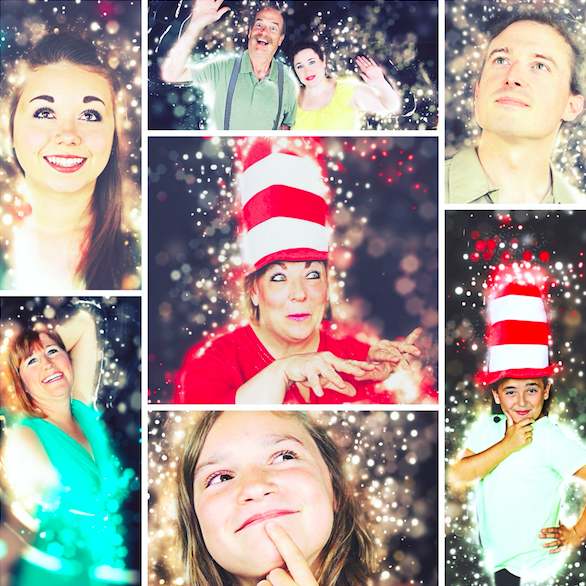 This unforgettable musical caper will star QNEK’s Founder Lynn Leimer as the Cat in the Hat. 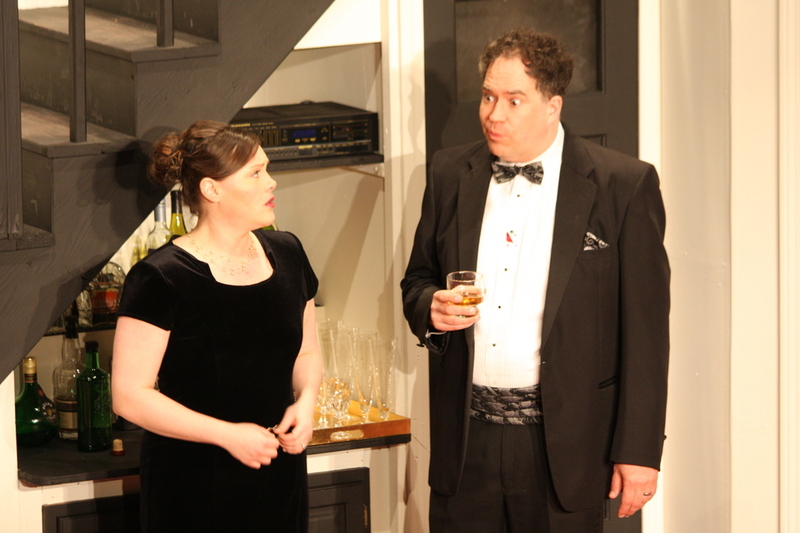 Rounding out the season is an uproarious comedy Farce of Nature, directed by Phil Gosselin. What happens when a mobster in protective custody, the guy he ratted out, a desperate housewife, and a pack of wild animals descend on a fishing lodge in the Ozarks? Hilarity ensues. Check out QNEK.com or call 802.334.2216 for more information on all of the plays this season, and to take advantage of the special pricing for 2016 Season Passes which will only last until March 11. QNEK continues to celebrate quality and community in it’s 24th season, so don’t miss it. 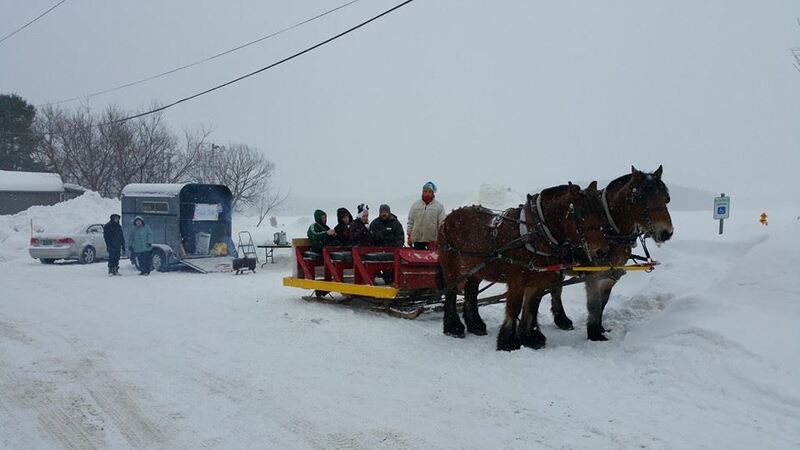 ISLAND POND — The Island Pond Chamber of Commerce is inviting everybody to attend their Winter Carnival this Saturday and Sunday February 13th and 14th. 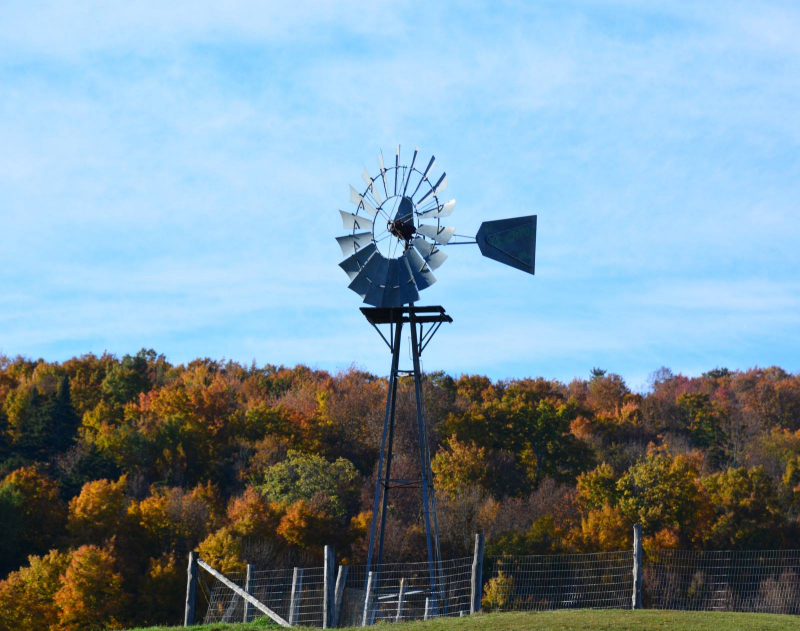 The event will feature many perennial favorites including hay rides by Narrow Gate Farm, pastries and hot chocolate by Bob the Baker, sugar on snow by the Osborne Family, pond golf-in and the bonfire provided by the Twelve Tribes. New this year is their first annual Chili Cook Off. Due to the lack of snow this year a couple events have been canceled including the open house at the Northwoods Stewardship Center, the cardboard sled race and the snow sculpture contest. 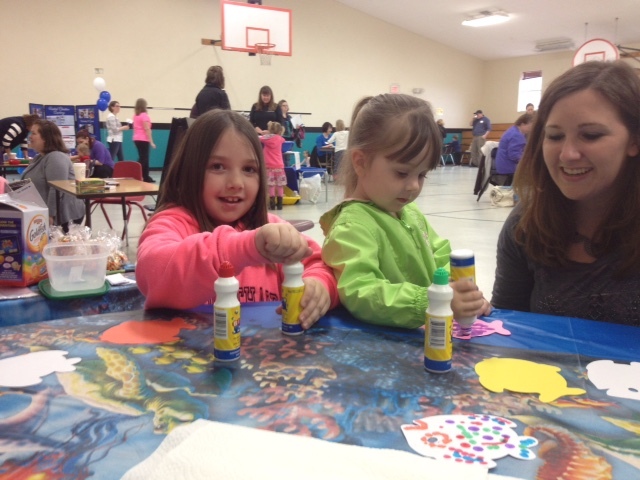 They have however added two new events in their place including making natural bird feeders at the Welcome Center and the coloring contest held at and sponsored by The Pond’s Edge Pub & Brewery. NEWPORT — While the Northeast Kingdom has been experiencing an unusually warm winter, replete with green grass and significant absence of snow and ice; there is one spot in Newport that you can glance the glaciers and feel the chill. 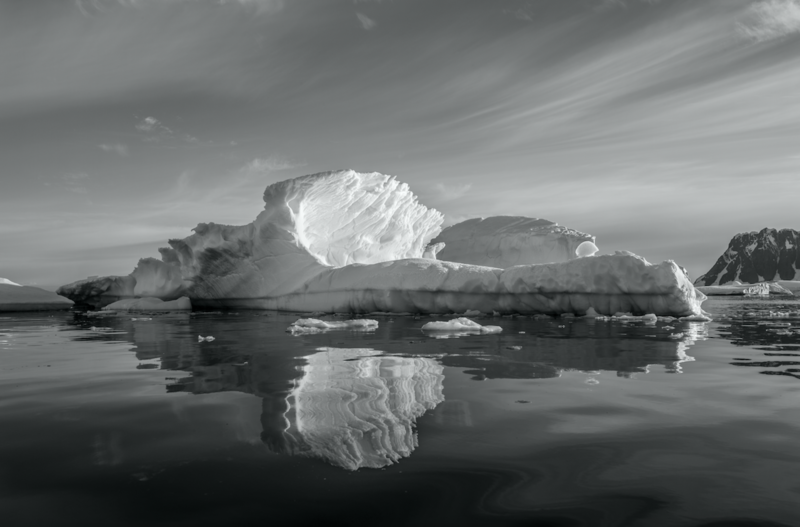 The MAC Center for the Arts is proud to announce the exclusive exhibit, opening February 20 in the downstairs gallery: ANTARCTICA – a Photographic Journey, by photographer, Stephen K. Malshuk. Malshuk was born in Newport, Vermont in 1952. He holds a B.S. in Secondary Education, University of Vermont, 1974 and J.D., University of Puget Sound, 1985. 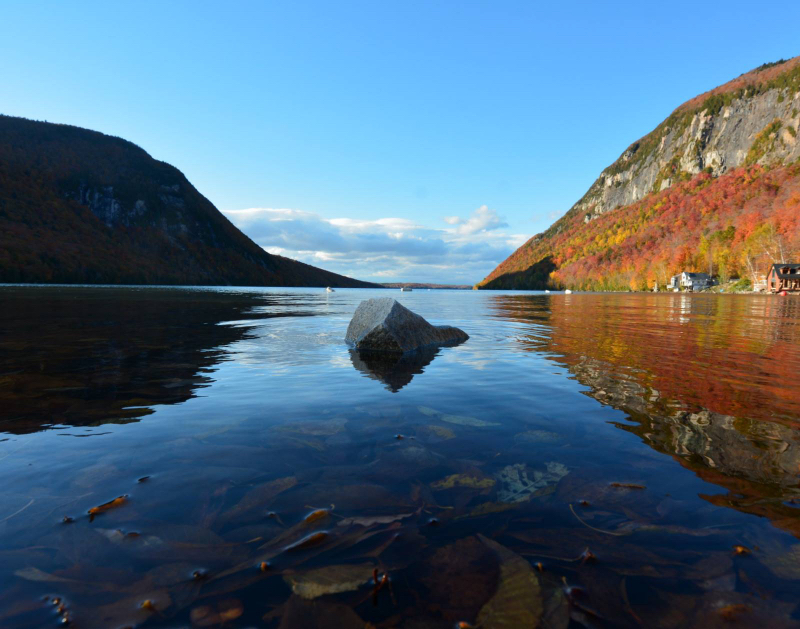 Steve spent his formative years in Orleans before going to Burlington, Vermont to attend college. To keep him from being too bored growing up; he spent lots of time at the Jones Memorial Library. While there, he found his favorite magazines contained the most photographs. What Orleans lacked for excitement, the photos in those publications compensated for. 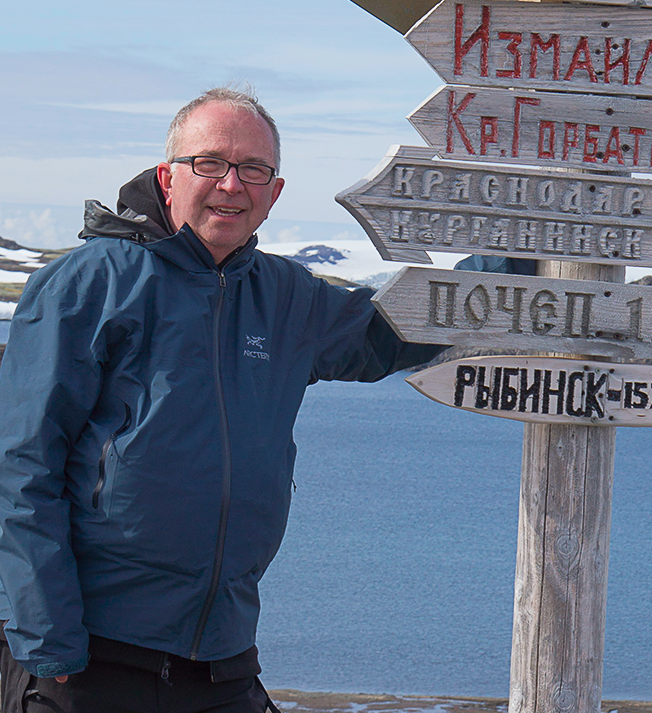 The photos in this exhibit are part of his “bucket” list of visiting all seven continents. Recently, he visited Asia. His remaining two continents are Africa and Australia. Malshuk’s photographs have appeared in “California”, 1980, (Polaroid Type 52), Camera Arts Magazine, April, 1983; “Mt. Rainier”, 1986, Seattle P-I, June 17, 1999; “Self Portrait – watching my children at the beach”, 2001, (quad-black digital print) Seattle . NEWPORT — After a furnace malfunctioned and blew sooty smoke throughout the Goodrich Memorial Library last month, the library is now open and having a fundraising event this weekend to help pay for the damages. After a month-long cleaning, all traces of the smoke damage are gone. Restoration Unlimited and the staff of the Goodrich have done a fantastic job restoring the library to its former glory, with new displays as well as offering regular services. The library’s insurance will cover most of the restoration costs, but are still left with a $5,000 deductible payment. If you would like to help, come out this Saturday to the library from 10 a.m. to 5 p.m., for a special day filled with activities. All events are free and open to the public with the hope that donations will be generous. 10:00 a.m. – Special story time featuring “SkippyJon Jones,” and other stories, a variety of crafts for kids with a chance to win SkippyJon Jones stuffed animal. 11:00 a.m. – Music by Nate Sargent and his guitar. 1:00 p.m. – We’ll be showing a brand new movie based on the bestselling novel about an astronaut who is presumed dead, after being left behind on a journey to Mars! Starring Jeff Daniels, Matt Damon, Michael Pena. All Day – Bake Sale. 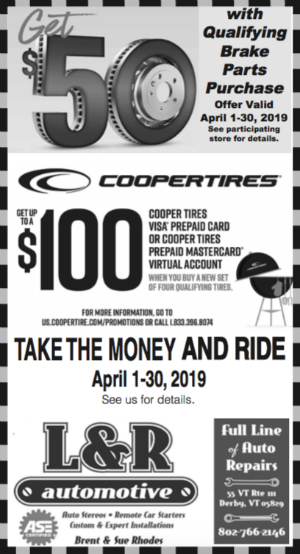 Raffle tickets on sale, and prizes include: 3 month Wellness Center membership, PumpHouse tickets for 4, Greens fee at Orleans Country Club, and more. NEWPORT — A closing celebration of Lisa Eshleman Foster’s one woman exhibition at the MAC Center for the Arts will be held on Saturday January 23, from 12-5 p.m. 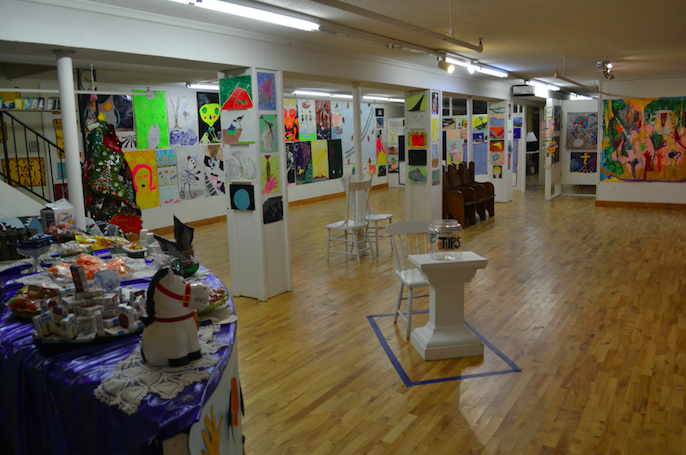 The event will take place in the Downstairs Gallery at the MAC, located at 158 Main Street, in Newport. All those who attended the opening reception and entered the raffle or attend this closing reception and enter the raffle will have the opportunity to win a piece of Lisa’s unique artwork. Both raffles will be drawn at the end of the day January 23. You do not need not be present to win. For those interested in purchasing one or more of Lisa Foster’s work to brighten up your space, most all of the 200 plus pieces will be reduced in price with a portion of the proceeds going to the MAC Center for the Arts. This sale does not extend to items in the upstairs gallery. This will be the last time the public has a chance to view this particular installation. Refreshments will also be served for those who attend. UPDATE: The library has furnace problems and will be closed. Wednesday’s Humanities Program will be at the Gateway. 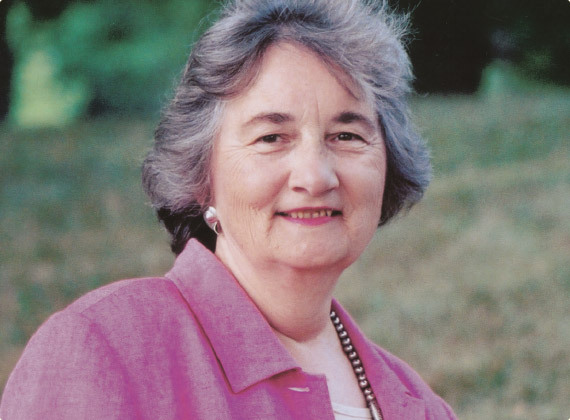 NEWPORT — Award-winning Vermont author Katherine Paterson will speak about the importance and many benefits of reading in a talk at the Goodrich Memorial Library this Wednesday, starting at 7:00 p.m. Her talk, “Reading for the Life of the World,” is part of the Vermont Humanities Council’s First Wednesdays lecture series and is free and open to the public. Paterson has twice won both the Newbery Medal and the National Book Award. She received the 1998 Hans Christian Andersen Medal as well as the 2006 Astrid Lindgren Memorial Award for her work. 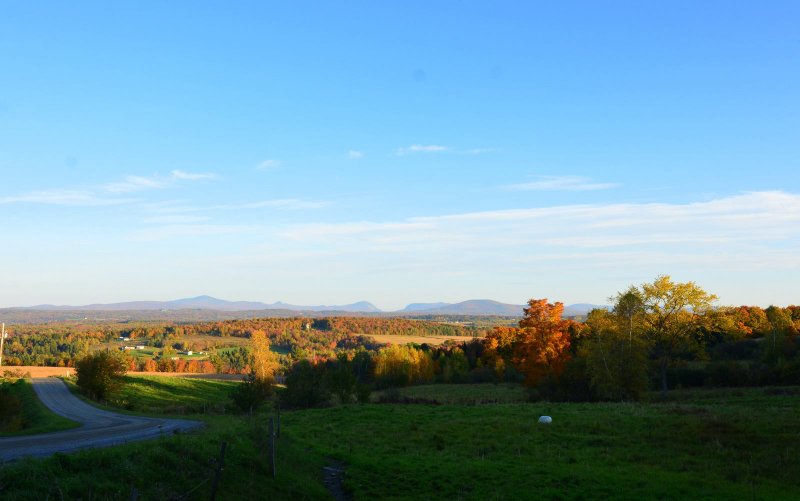 The Vermont Humanities Council’s First Wednesdays series is held on the first Wednesday of every month from October through May in nine communities statewide, featuring speakers of national and regional renown. Upcoming Newport talks include “Confused by the News?” with veteran journalists David Shribman and Cynthia Skrzycki on February 10, “Photographing Any Place: Real or Ideal?” with Vermont photographer John Miller on March 2, and “Myths of World War II” with UVM History Professor Emeritus Mark A. Stoler on April 6. For more information, contact the Goodrich Memorial Library at 802.334.7902. Members are from left to right: Frank Rudolph, Kathy Ketchum (violin), Anne Steinberg, Paula Hansen-Graveline, Lisa C. Erwin (flute), Linda Aiken, Chris Maginniss (clarinet) and Judy Hurd (bass clarinet). 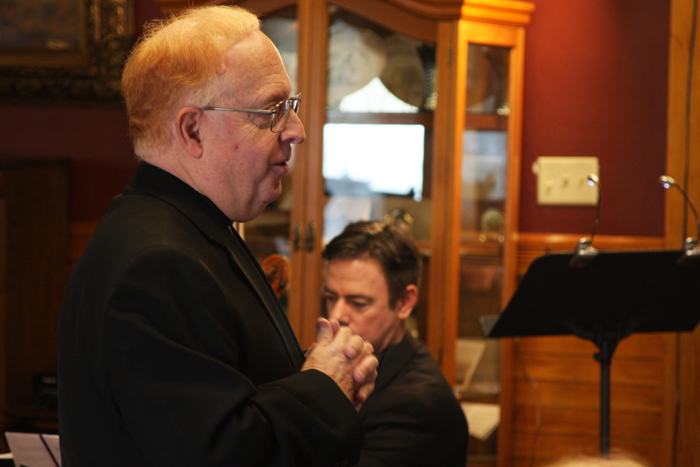 DERBY LINE — On Sunday, the First Universalist Parish Ensemble (FUP) played a selection of Christmas music for the residents at the Michaud Manor in Derby Line. The FUP Ensemble is a small chamber ensemble based in Derby Line. Its members also play in the Newport Area Community Orchestra. “We were invited to play at Michaud Manor by Anne Steinberg, who is the administrator for the facility,” Ken Michelli, Music Director of the Newport Area Community Orchestra, said. Michelli conducted the ensemble on Sunday. Susan Maginniss and Vern Hurd also assisted the residents with the singing of several traditional carols. 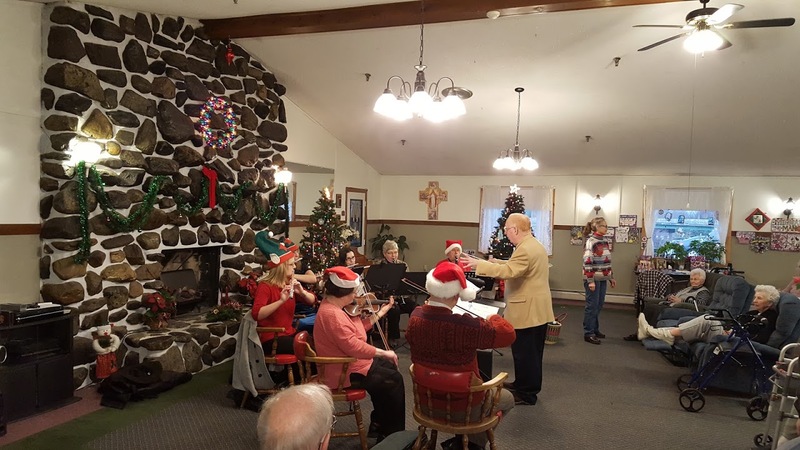 Orchestra members have already performed for the residents at Bel-Aire Nursing Facility in Newport, Craftsbury Community Care Center, and The Meeting Place Adult Day Care in Newport. “The residents always seem to enjoy the music and some were quite responsive in their support of the group,” Michelli said. The ensemble can be heard playing on selected Sundays at the First Universalist Parish. STANSTEAD — For a few years now, businesswoman Erin Garand had been thinking about opening a cafe or bar where people could come together at the end of the week from both sides of the border, and unwind. The opportunity presented itself when Sans Frontières Café in Stanstead temporarily closed its doors in June. Since then, Erin and her husband Jason Hartley have taken over the landmark bar on Rue Dufferin, spending months decorating the club, and working to bring new activity to the border town. The bar reopenend as Cabaret Sans Frontières in November. Erin’s vision was a place that combined comedy and music. “I wanted this to be a place that brought people together for good times and laughter, and where people would say ‘wow’ when they come in.” Garand said. Cabaret Sans Frontières is just that. The club is beautifully decorated and provides a classy, romantic atmosphere for patrons. They offer a full bar, and serve light fare throughout the weekend shows. 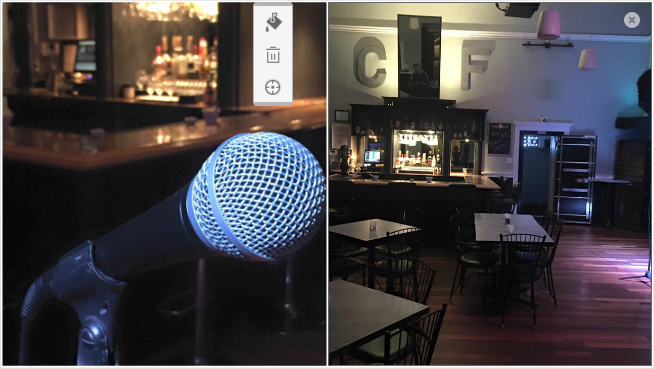 Every Friday the club features stand-up comedy, which, through Comedylounge.ca, has already featured some of the best comedians in the country. Shows generally have 3-4 comedians per night. Saturdays at the club is always live music. 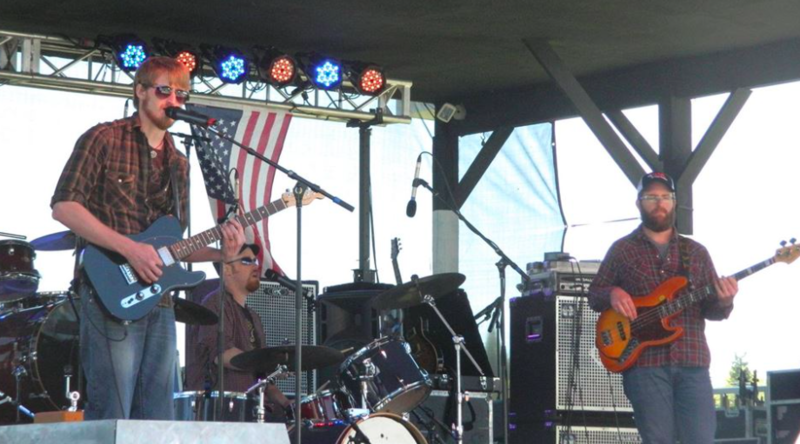 Shows are booked well into 2016, and are usually tribute bands, paying homage to such legends as Creedence Clearwater Revival, and Heart. Cabaret Sans Frontières is just another example of the revitalization that has been taking place on Rue Dufferin over the last few years. Angel in the Heart of Your Kitchen at Restaurant la Vieille Douane, which sits in the old customs building and just next door to the new Cabaret, reopened its doors this summer, and there are a few more projects in the works. This Friday’s comedy show will feature Paul Baluyot and friends. Paul Baluyot is a Montreal based stand-up comedian. His charming, clever and laid back style has allowed him to work on many stages, touring throughout Canada, the United States, and the Philippines. He will be performing alongside a carload of hilarious comedians. Music this Saturday will feature Priscillia Quirion, from La Voix TV Show. 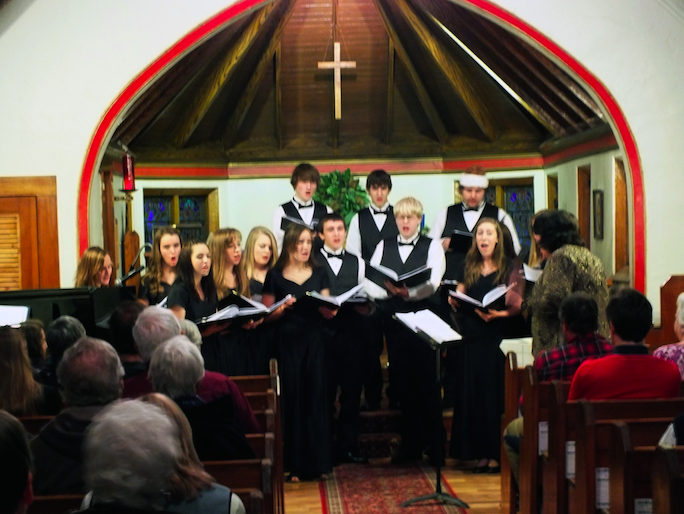 The bar opens at 5, with shows starting at 8 p.m.
NEWPORT — This Sunday, December 13, at 3 p.m., the very talented youth from the Lake Region Select Choir will present their 3rd Annual Holiday Concert for the Now Playing Newport Music Series. Dr. Sara Doncaster is the Music Director and Mark Violette will be the accompanist. The program will be held at St. Mark’s Episcopal Church, located at Second Street, in Newport. The program is part of the Series Youth Programs and is open to the public and admission is free. “We were happy to bring them to the Series in 2013, the first time they performed outside of the gym at Lake Region, and is now an annual tradition,” Jim McKimm, executive Director of Now Playing Newport said. Anyone wishing to make a donation to the great work that Doncaster does with the Lake Region Music Program are welcome. Cookies and punch will be served following the program. The show will be a perfect way to bring in the Holiday Season and support this great Music Program. This is the last program of the Series for 2015. The Third Season begins on January 3rd with the Annual Swinging Epiphany Celebration with the 18 piece Swing North Big Band. Selections for the program include: “I Saw Three Ships” – Traditional Carol, “Noel”(text in the African Kituba dialect), “Children Will Listen” from Into the Woods, “I Got Rhythm” by George & Ira Gershwin, “Hine Ma Tov” – Hebrew Folk Song, “Awake Sweet Love” – Renaissance Madrigal by John Dowland, Men’s Ensemble – Nat King Cole’s “L.O.V.E.”, Women’s Ensemble – SSAA Arrangement of “My True Love Hath My Heart” by John Rutter, and Soloists performing art songs and arias in Italian and English. Singers are: Soprano – Emily Klar, Olivia LeBlanc, Emma Strange, April Streeter; Alto – Phoebe Barker, Karamae Hayman-Jones, Bianca MacKay, Jade Piette; Baritone – Nathaniel Chambers, Jade Dennison, Hunter Duuette, Ryan Streeter. MAC Education Committee Member, Diana Poulin instructs members of the Association for the Blind and Visually Impaired on the techniques of pottery making. Seated (l to r): Harriet Hall, John Hall, Neil Young, Jim McIntyre, Kitty McIntyre, (standing) MAC Education Committee member, Bonnie Nash, Paula Fitzgerald, Alain V.
NEWPORT — The MAC Center for the Arts recently worked with Harriet Hall from the Vermont Association for the Blind and Visually Impaired to conduct a pottery class for thirteen of its members. Even though some of the members are completely blind and many have diminished sight unable to actually see their work, the participants enjoyed using their hands and working with the clay. Each member made two pieces, a pinch pot and a coiled pot. Once glazed and fired, the artwork will be returned to the participants. Diana Poulin, the owner of Muddy Waters Studio in Newport, organized the event, donated all the supplies, and conducted the class. Poulin’s pottery is on display at the MAC Center gallery as well. DERBY LINE — Last week the Hungerfest Concert was held at the Haskell Opera House, raising a total of $31,635 to help support NEKCA’s food shelf. The concert marked the end of this year’s Hungerfest drive. Other fundraising efforts, including the Hungerbowl, radio, newspaper, and Facebook challenges, brought in an additional $5,090, bringing this year’s donation total to $36,725. The concert featured local singer-songwriter Tod Pronto, who opened up for legendary musician Jonathan Edwards. Community partnerships played an important role in helping Hungerfest break donation records this year. Once such partnership was with AutoSaver Group, one of New England’s largest auto dealer groups. Mr. Lyster and Abel Toll of AutoSaver Group decided this year to create an annual event that could motivate people and other local companies to donate to Hungerfest, rather than just making a donation as they have done in the past. Tod Pronto got the crowd going with a short opening set that showcased some songs off of his new album, “It Can’t All Be Wrong.” He also performed a touching new song he recently wrote about his mother who passed away earlier in the year. 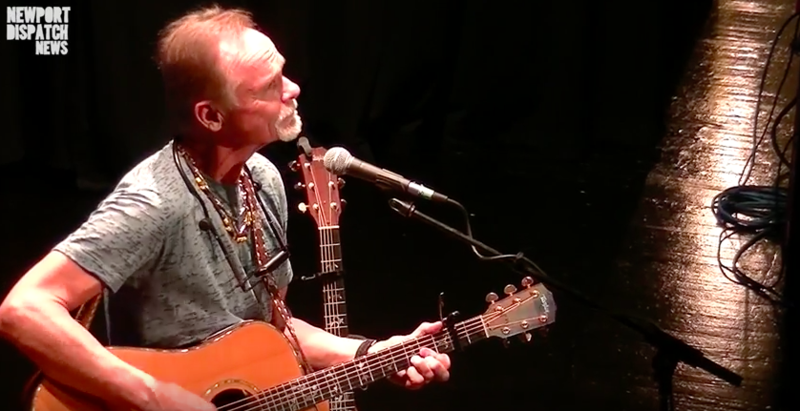 Jonathan Edwards, the famous singer-songwriter and musician best known for his 1971 hit single “Sunshine,” closed out the evening with an intimate performance of songs that spanned his entire career. In between songs, Edwards talked with the crowd about his career and the way songs came about, treating the audience to an intimate look at his life and music. NEWPORT — Break out your holiday spirit and release your imagination, because the MAC Center for the Arts is holding its 5th Annual Handmade Holiday Craft Workshop. The event is free for kids ages 8 and up, although donations are appreciated. Each child will have the opportunity to make three or four ornaments to take home with them. They include a folded paper Christmas tree, a bean and lentil covered star, and a modern tin art ornament made with aluminum foil. The workshop will be held in the MAC’s downstairs classroom, located at 158 Main Street in Newport, on December 5, at 9:30 a.m. The activities will take 1 to 1 ½ hours to complete, so you will be done in time for the Santa parade. Contact Diana Poulin at 673-8808 or by emailing her at vtdianap@gmail.com. You can also visit the MAC on the web at www.maccenterforthearts.com. NEWPORT — Starting this Friday, a local artist will be having a one woman show at the MAC Center for the Arts in Newport. On the same night, the MAC is also hosting a Holiday Reception and displaying new works. The event, which takes place on November 20, starts at 5 p.m. and runs until 7 p.m. This brightly colored installation is hung salon style in the lower gallery at the MAC. Her work has been shown in private collections from Germany, Italy, New York, Pennsylvania, California, Colorado and Vermont. She was born in Lancaster, Pennsylvania, and holds BFA from Kutztown State College. Foster has a personal history of creativity that goes way back as well. 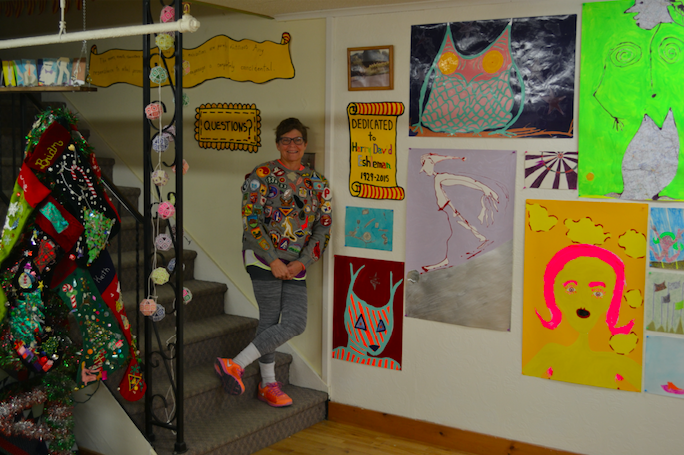 She has worked creatively her whole life, and since moving to Newport has been involved with QNEK, doing theatre work, as well as painting the sets. The painting of Manhattan on the back wall at the Haskell Opera House is hers. Foster emphasizes that to truly understand what she is doing, it is important to come to the gallery and see all the work, with some of her work telling a family story. The public is even invited to participate in a group activity during the show, and if they participate their name will be entered into a drawing, both figuratively and physically. They will be asked to trace their hands on canvas to be used eventually in another installation. The winner will receive a painting from Ms. Foster. “This extraordinary installation by Lisa Eshleman Foster is sometimes theatrical, often amusing and wry, but mysteriously moving and very personal,” Lynn Leimer, of QNEK said. “Not to be missed,” she adds. In the Main Gallery the annual Holiday Reception will be displaying new works. 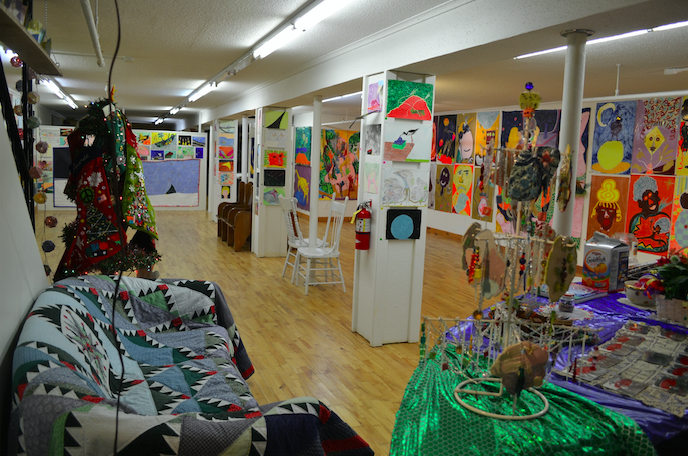 Visitors upstairs can browse the plethora of unique hand crafted gifts by artisans working in many different mediums. Free admission, all are welcome. For more information, 802-334-1966 or www.maccenterforthearts.com. 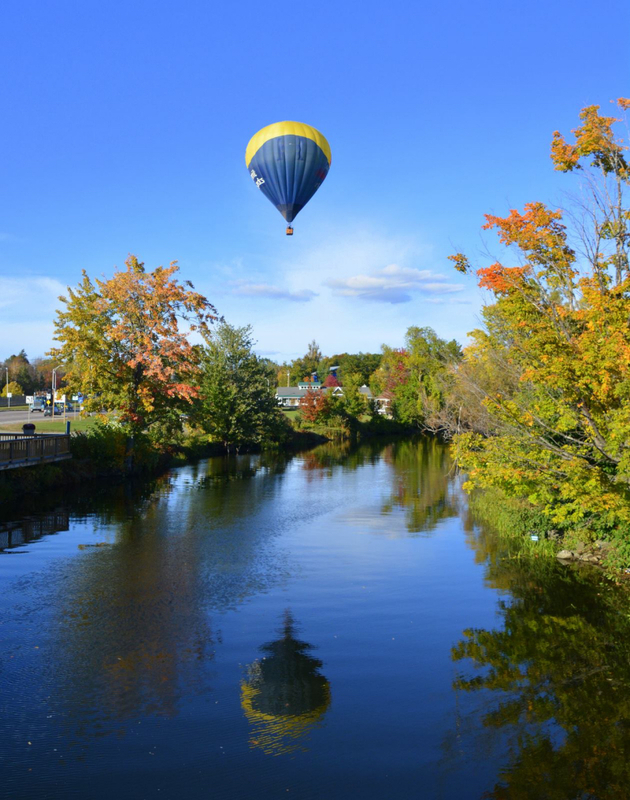 ISLAND POND — The Island Pond Chamber of Commerce and The Brighton Community Forum are now in the running to bring a 10-week live music series to Island Pond during the Summer of 2016. Sponsored by Levitt Pavilions, the national nonprofit behind the largest free concert series in America, the Brighton Community Forum hopes to qualify as one of the 15 winning organizations competing in the Levitt AMP Grant Awards. The Levitt AMP Grant Awards are an exciting matching grant opportunity created by Levitt Pavilions to serve small to mid-sized towns and cities up to 400,000 people. Fifteen nonprofits, or municipalities partnering with a nonprofit, will receive up to $25,000 each in matching funds to produce their own Levitt AMP Music Series—an outdoor, free concert series featuring a diverse lineup of professional musicians. 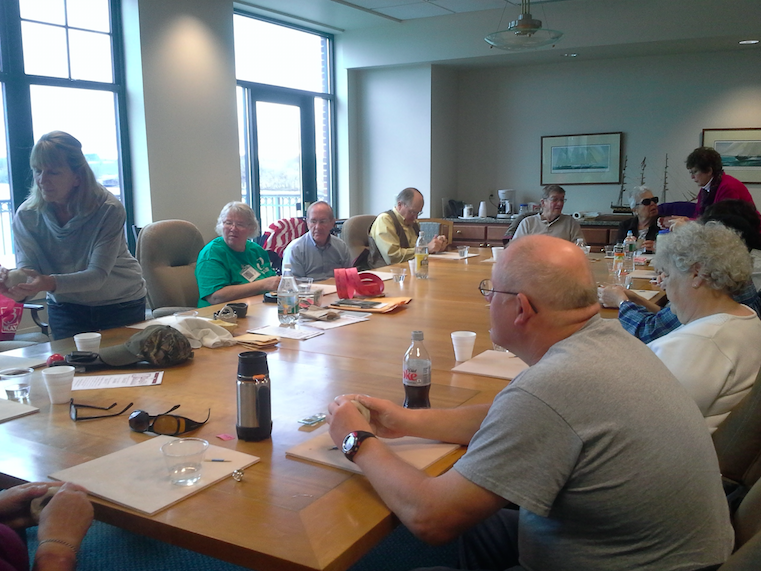 The Brighton Community Forum submitted the proposal for Island Pond. The proposed venue site is Lakeside Park and will be incorporated into the currently popular Friday Night Live series. Island Pond’s proposal is now posted on the Levitt AMP website for public voting at: http://levittamp.org. A successful campaign for the Brighton Community Forum depends on community participation to get as many online votes as possible to bring the concert series to town. Community support, as measured by the number of online votes received, will be one of the key factors when Levitt Pavilions selects the 15 winners. 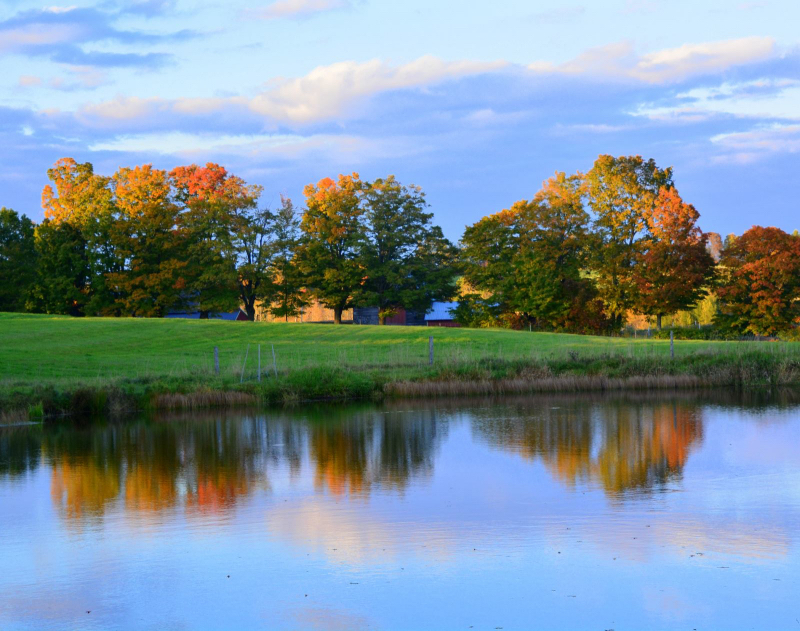 As the smallest town competing in this national competition, the Brighton Community Forum asks supporters to start spreading the word to family, friends, colleagues and neighbors and rally the community to sign up and vote for Island Pond’s proposal. 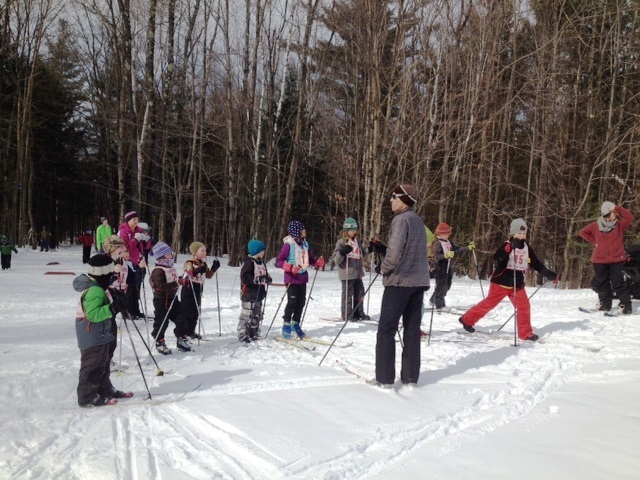 Local elementary school children learn cross country ski skills at the after school Bill Koch Youth Ski League at MSTF. 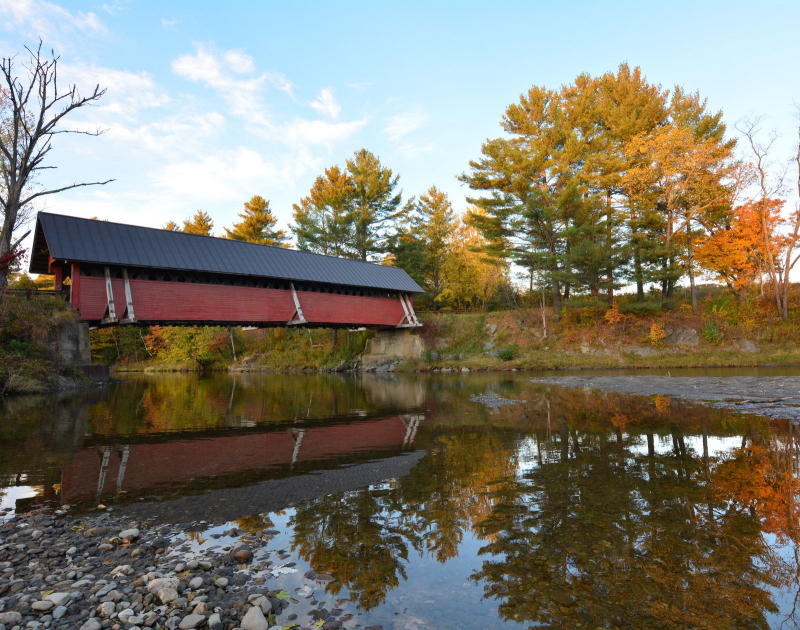 NEWPORT — Just a few short steps across a wooden bridge from the bike path and into the Primeau Woods as they are sometimes called, the Memphremagog Ski Touring Foundation (MSTF) trails are open for activities throughout the year. 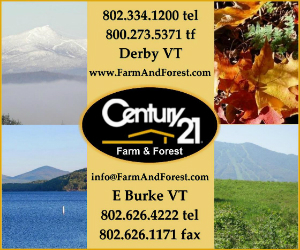 These 100 acres located between the Beebe Spur Rail Trail and Darling Hill Road, provide a four season playground for hiking, mountain biking, cross country skiing, or just a quick get away from the hustle and bustle for a quiet walk in nature. 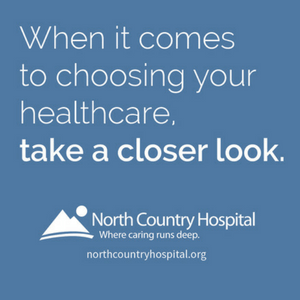 They are only minutes from downtown Newport or Derby but create a feeling of being a million miles away, and are easily reached when parking at North Country Hospital or MSTF parking off Darling Hill Road. The trails are carefully groomed in winter with cross country ski tracks and during this past summer a team of local volunteers have been cutting new single track trails for mountain bikes, maintaining existing multi use trails, building bridges, and doing what needs to be done to keep the woods in top condition for the community that enjoys them. Recently the trails have been host to several large-scale, regional cross country meets as the home ‘track’ of North Country High School. During the winter months the trails are also used for North Country High School ski team. 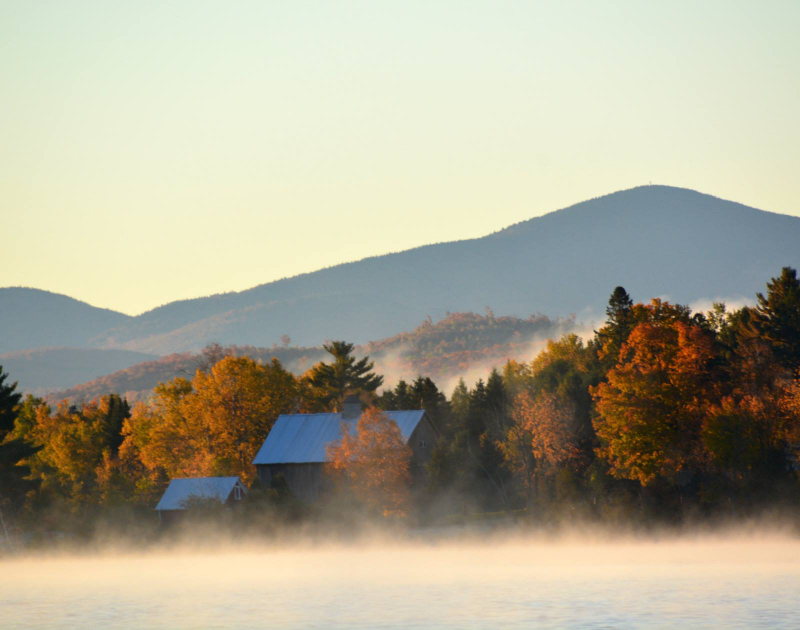 The Memphremagog Ski Touring Foundation trails, although on privately owned property, have been generously opened up for the community, however winter use of these trails requires MSTF membership. 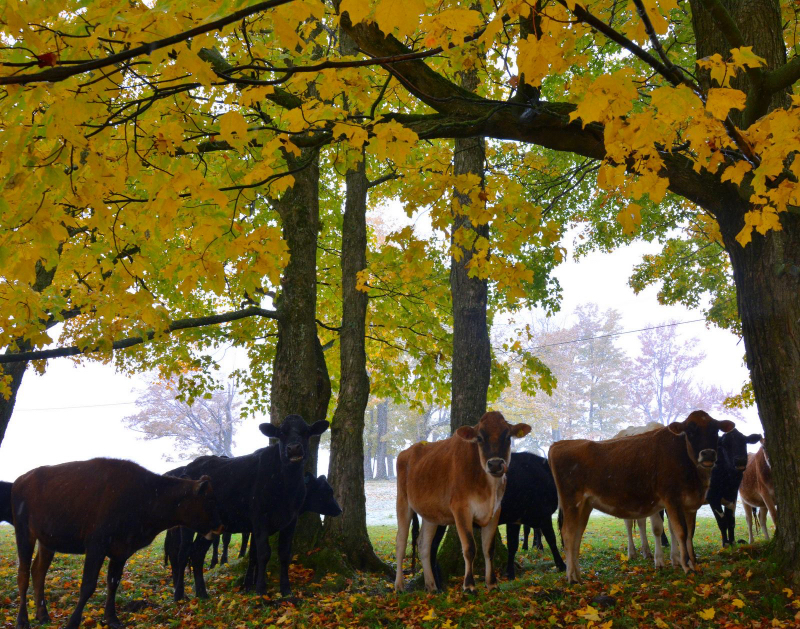 Maintaining and grooming them is expensive so every year MSTF holds a membership drive. For more information visit mstf.net or email mstfnek@gmail.com. 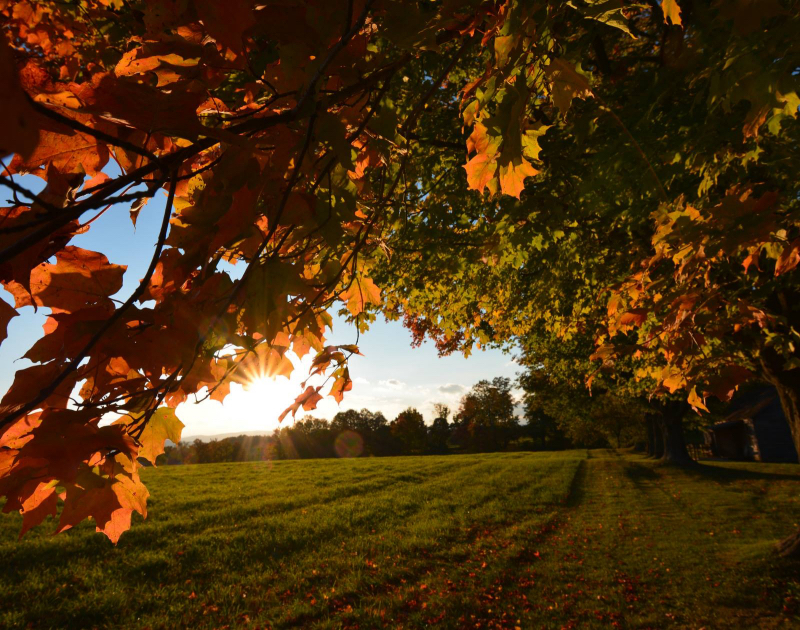 This photo essay from foliage 2015 in Orleans County comes from local photographer Rick Desrochers. Rick is from Derby Line. He grew up loving photography and all the beauty this area has to offer. He is the founder of Northern Dreams Photography. To dream of the direction of North symbolizes reality. It also indicates that you are making progress and moving forward in life. While living in Florida, I dreamt of the four seasons of the North, and “Northern Dreams Photography” was born, a dream that has become reality. At Northern Dreams Photography, it’s about capturing the simple things in life and the beauty of nature that we sometimes miss and take for granted. It’s about helping us to believe in our dreams of moving forward and anywhere that we can imagine. Photo by Douglas Flint: (Standing l-r: Linda Schneck, Logan Chaput, Lynn Leimer, Janice Luce, Ben Luce, (seated l-r: Todd Cubit, Mary Damiani, Allen Cubit) missing from the photo John Selmer, Susan-Lynn Johns. NEWPORT — The Mac Center for the Arts is presenting TAKE NOTE: Nostalgia – a musical event. Come out to the MAC Center for the Arts on Friday, October 23, at 7:30 p.m. for a truly memorable evening of nostalgia. A myriad of tunes will create an ambiance of joy and melancholy. Susan-Lynn Johns and Lynn Leimer will MC the event, taking the audience on an esoteric journey that embraces every genre of musicality. Featured performers include Janice and Ben Luce, John Selmer, Mary Damiani, Linda Schneck, Todd Cubit, Allen Cubit, Logan Chaput and of course the dynamic duo of Johns and Leimer. Seating is limited, so purchase your tickets early. Dusit Thai Cuisine and the Newport Ciderhouse Bar and Grill will be offering at 10 percent discount when you present your ticket the evening of the show. Legendary Champlain Chocolates will be providing some sweet treats for intermission. Tickets are $7.00 per person, and are available at the MAC Center for the Arts. All proceeds will benefit the Memphremagog Arts Collaborative. The MAC is located at 158 Main Street in Newport. 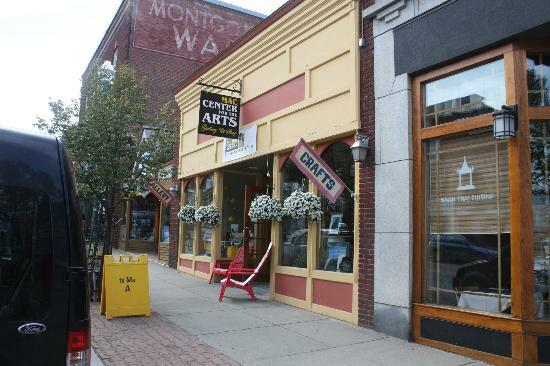 Visit them on the web at maccenterforthearts.com or call 802-334-1966.